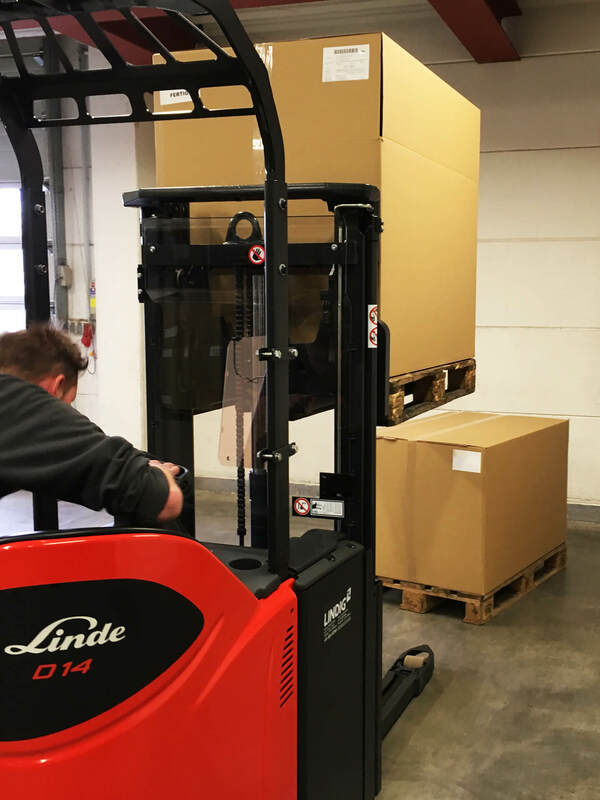 Linde representative, Marcus Trautheim (on the left) handed over the Linde double pallet stacker to Tobias Becker, head of the logistics department. 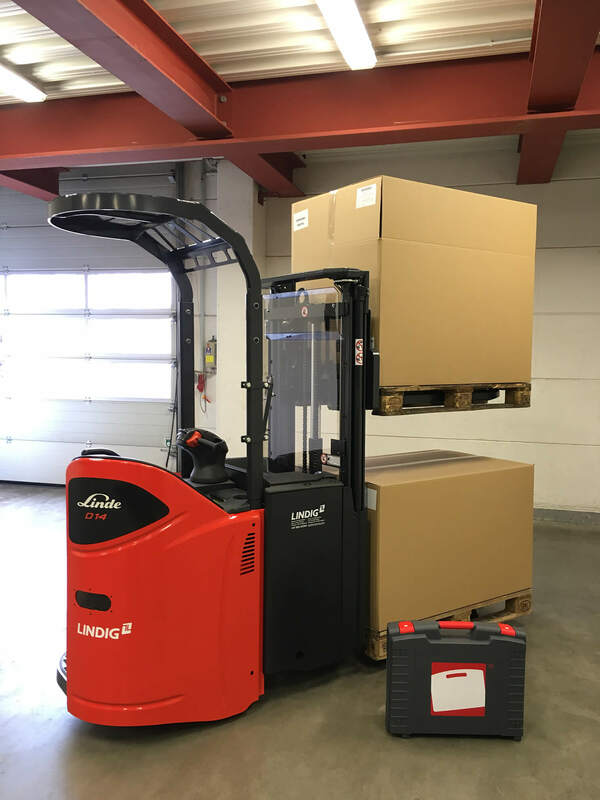 What’s unique about this pallet stacker is, among other things, the 2.93 meter fork height, the automatic elevation system and that it can transport two pallets at the same time. 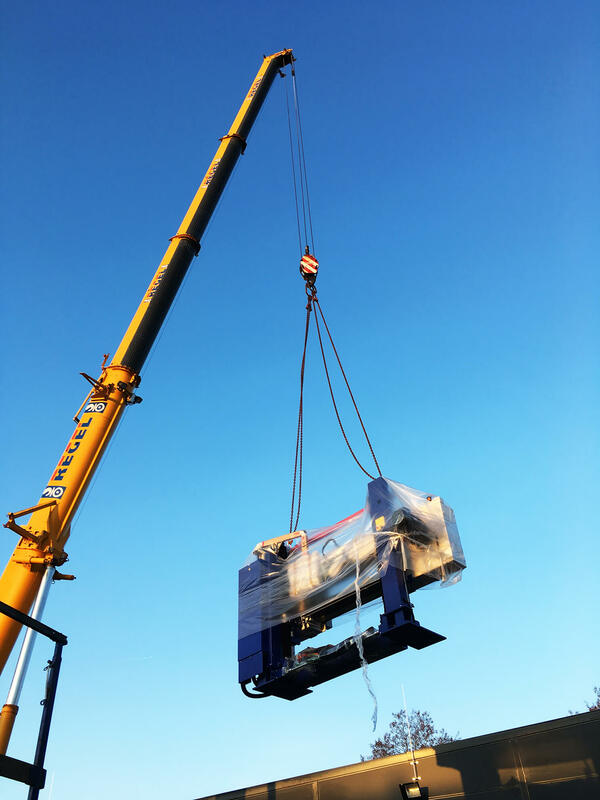 A crane was used to unload the parts for the new splitting machine off the lorry. 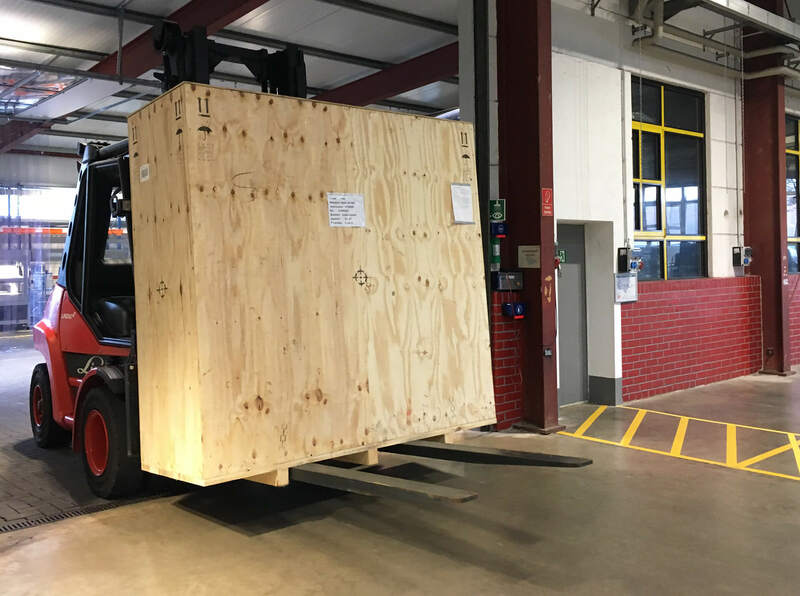 The splitting machine components were transported to the production facility for assembly. 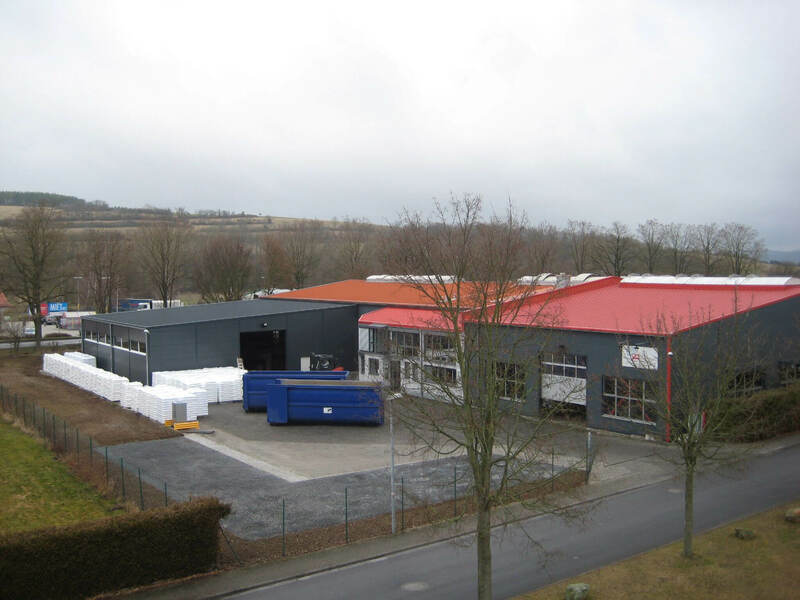 This is the assembled and ready-to-use splitting machine for processing foam. 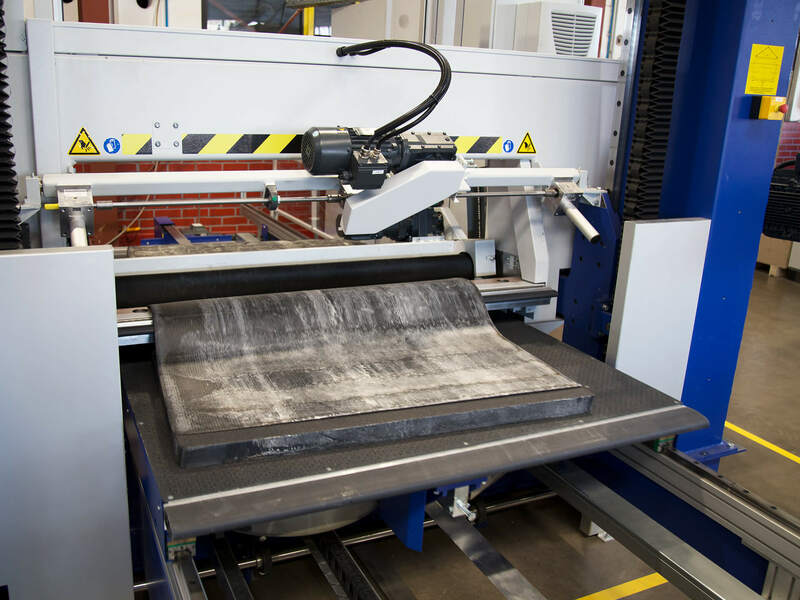 The splitting machine cuts these foam blocks into individual layers of varying sizes. 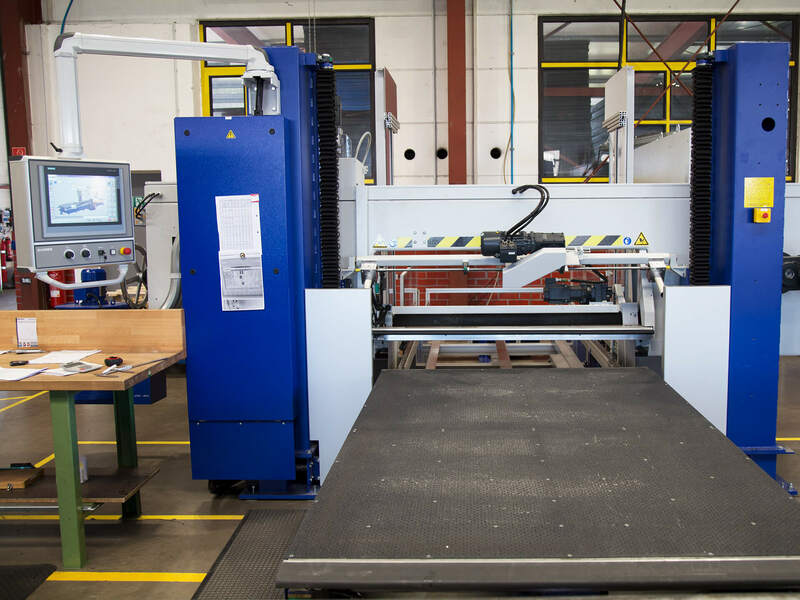 The splitting machine in action: The foam board lying on the shifting worktable is cut by means of knives. 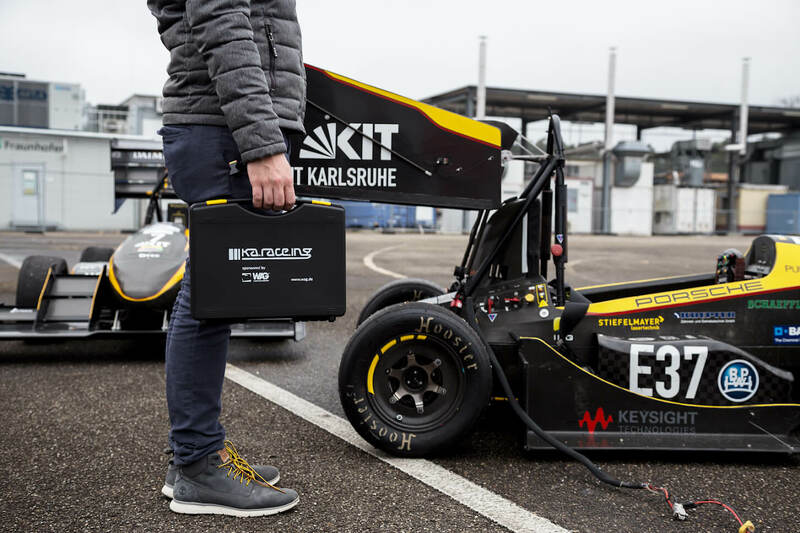 Forward and reverse speeds can be regulated between 1-80 m/min. 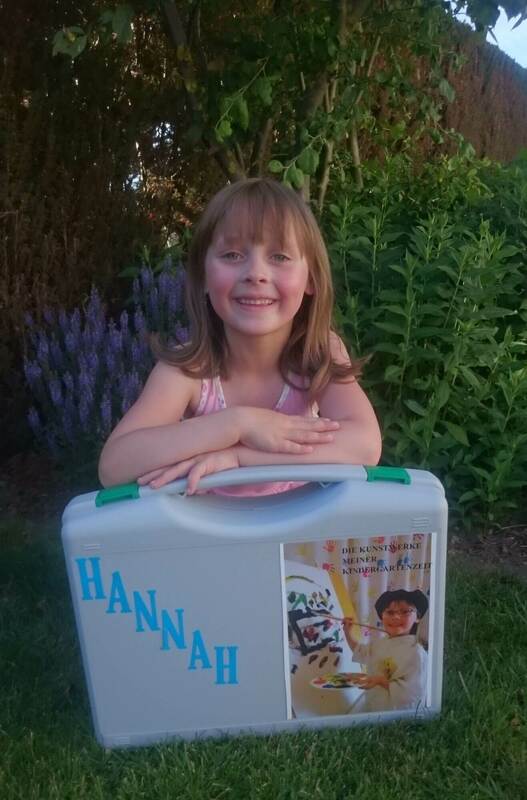 via control panel. 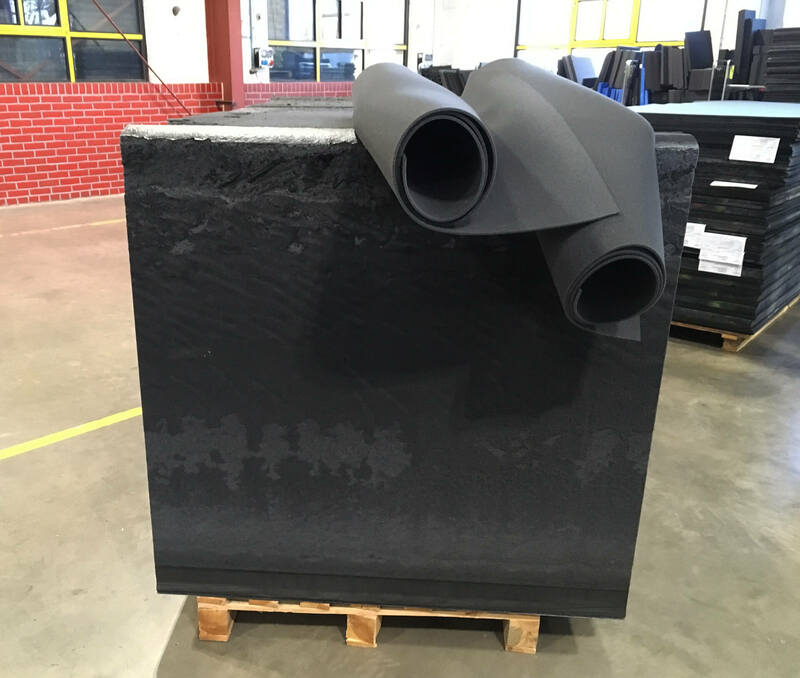 The thickness and forward / reverse speeds for splitting foam can be precisely defined using the control panel. 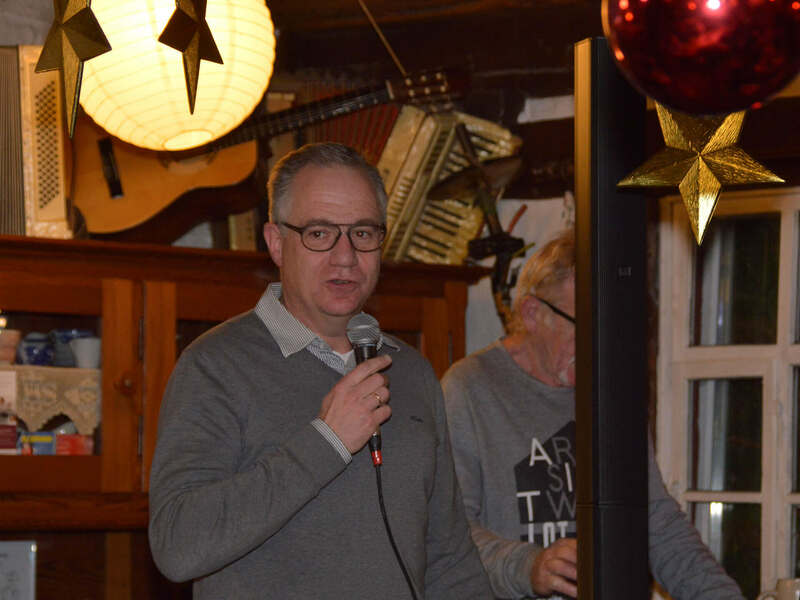 Geisa, December 2018. 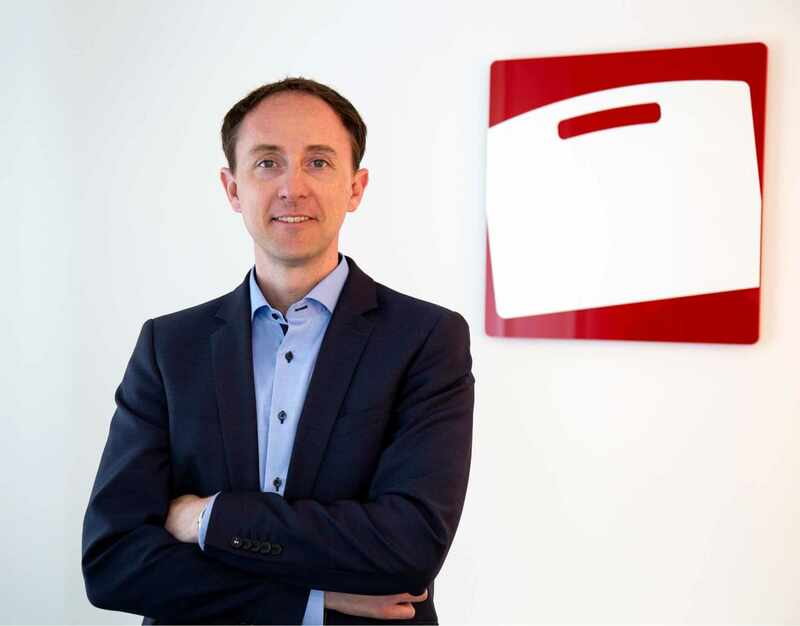 – Sales expert Bertram Göb and injection moulding expert Christof Hanschke form the new management of the renowned plastic case manufacturer W.AG since a few days ago, so the industry leader now operates under dual leadership in technical and commercial management. 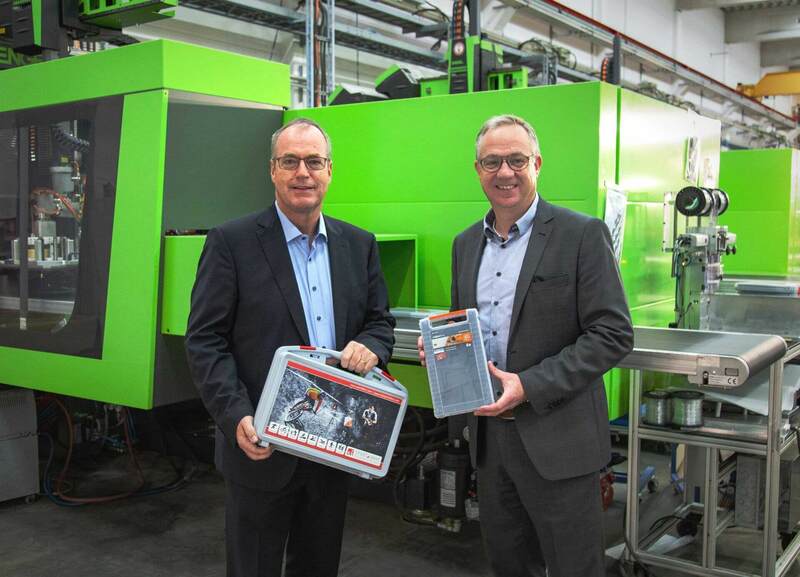 New dual leadership: Injection moulding expert Christof Hanschke (left) and marketing expert Bertram Göb (right) make up the new management board of the renowned plastic case manufacturer W.AG. 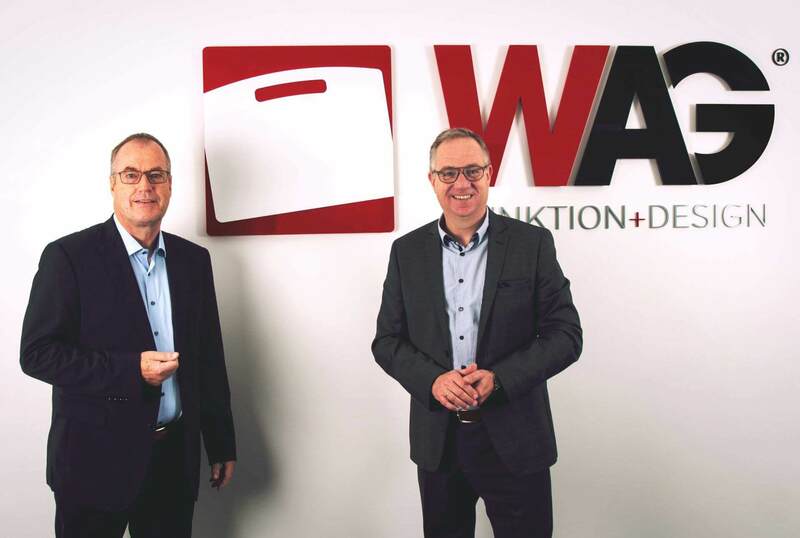 The new managing directors of W.AG: Bertram Göb (right) is considered an expert of the case industry and takes charge of the commercial department, including sales and marketing. 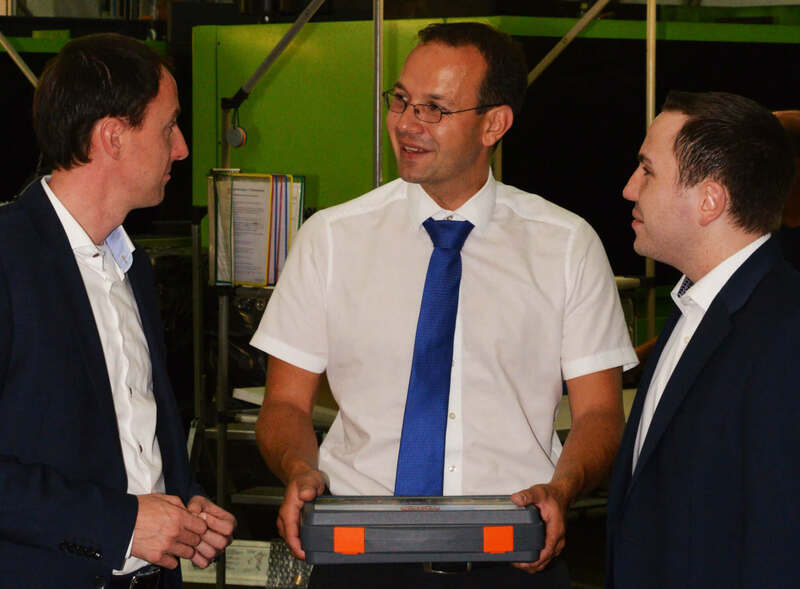 Christof Hanschke (left) will be responsible for technology and production, including toolmaking and logistics. 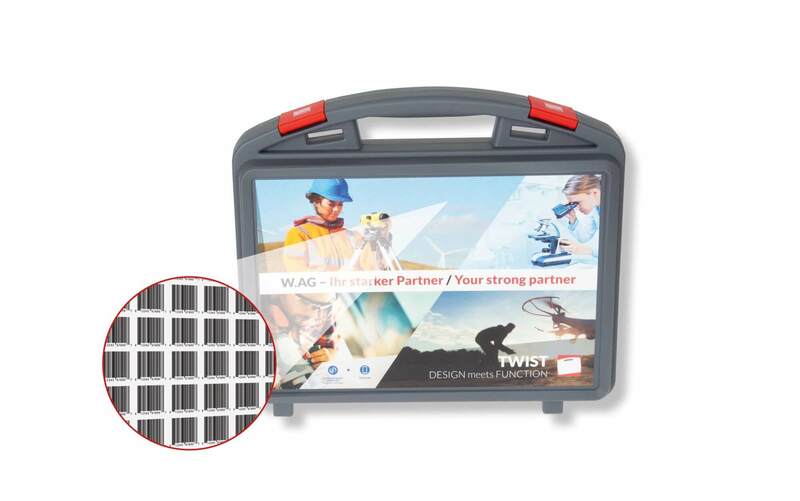 The latest case model, TWIST by W.AG, is currently available in 15 sizes (238 x 188 x 54 mm to 494 x 402 x 196 mm) and can be imprinted in high quality, in an in-mould labelling (IML) photo-printing process. 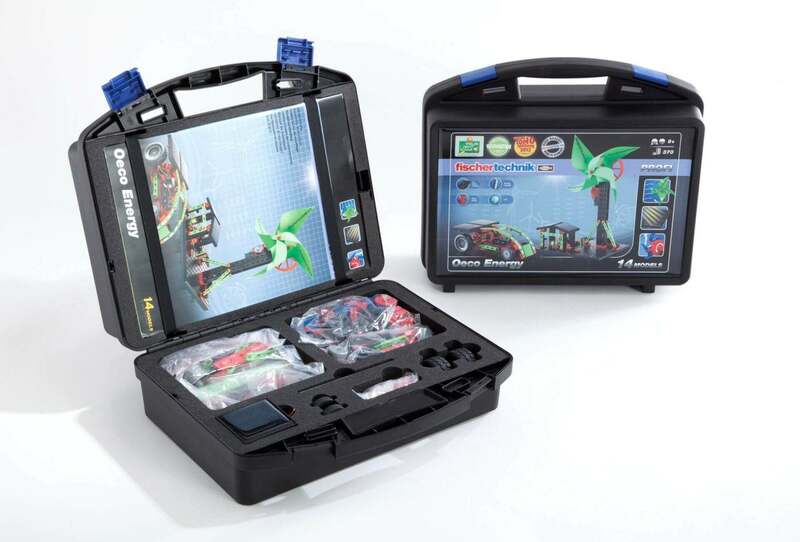 Toy industry, for example: customised TWIST plastic case by W.AG with high quality IML photo print and foam inlay. 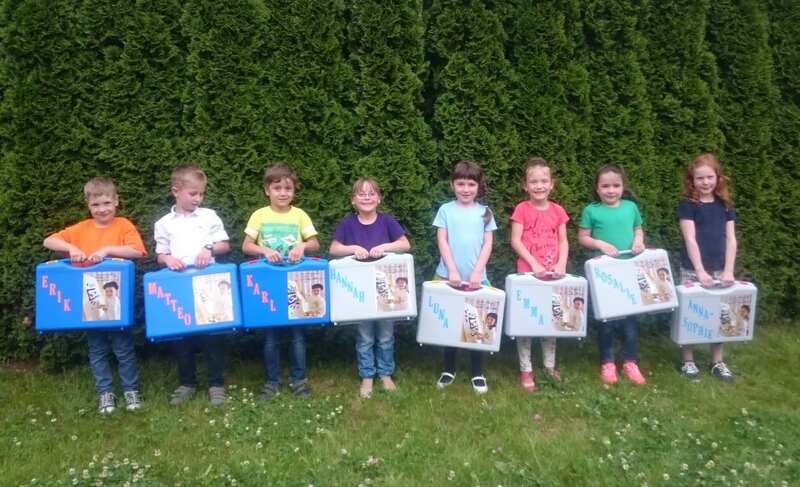 The small BEAT can be individualized from the inside and the outside. 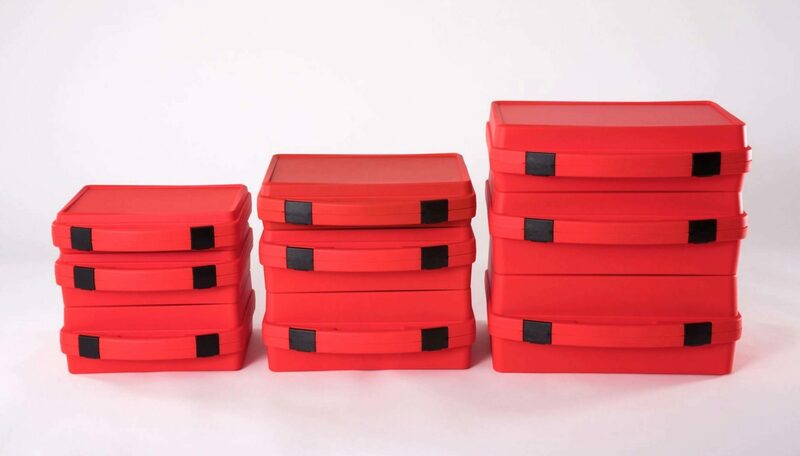 Small packaging solutions are often sought after as give-aways or promotional gifts to enhance the effect of the give-away. 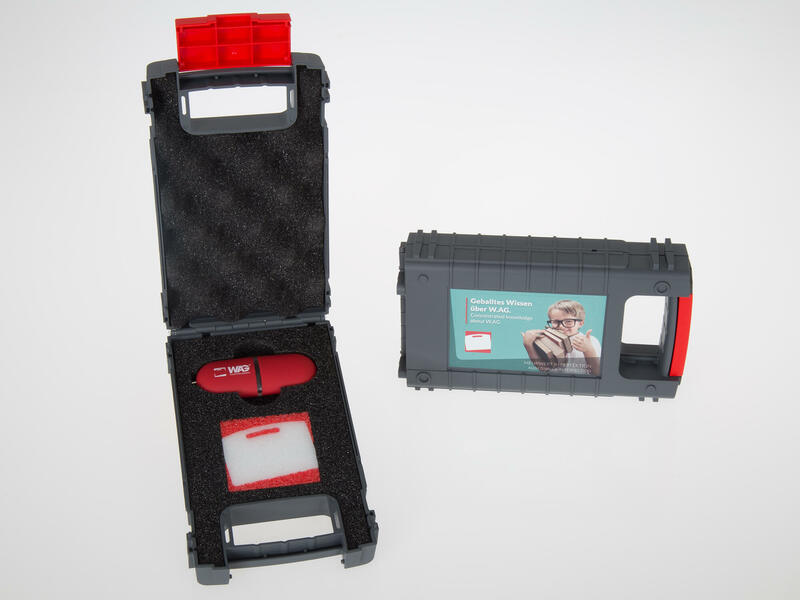 When it comes to the communication of a high-quality brand, the idea that “quality can only be communicated through quality” applies to the choice of the promotional item as well as the packaging. 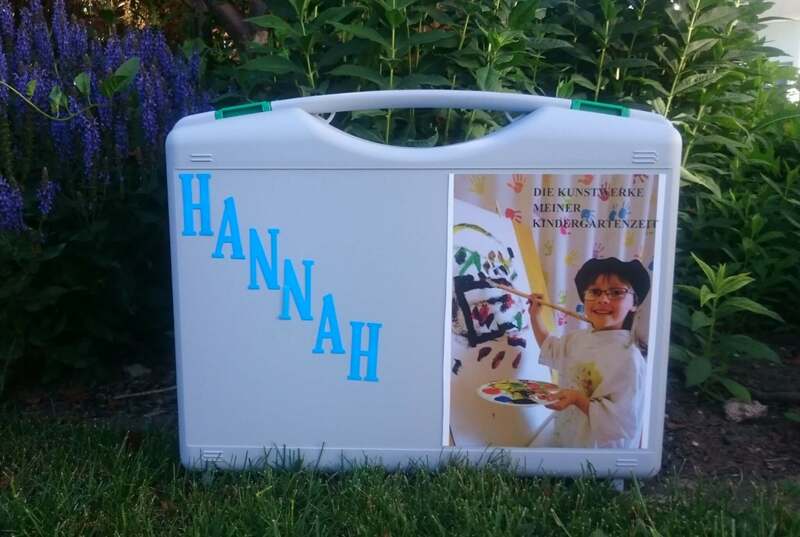 The BEAT can be decorated with pictures on both sides (front and back) via IML. 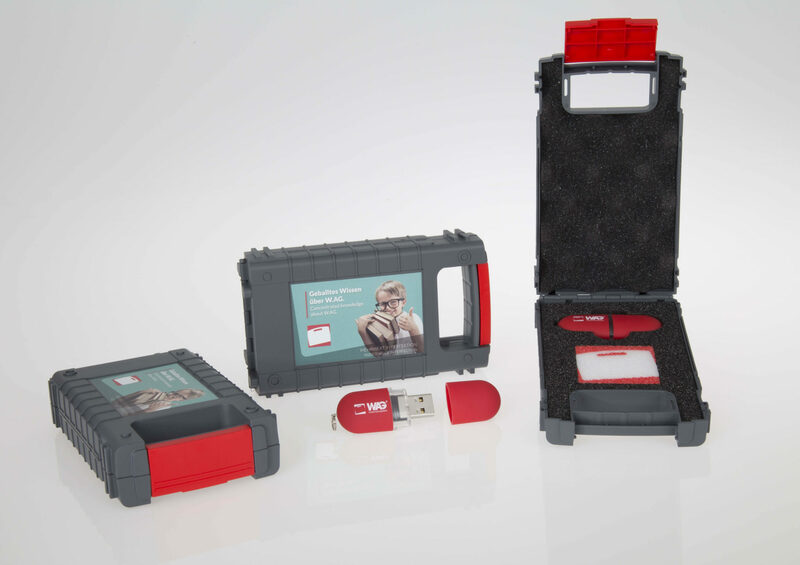 View from above: the foam insert placed on the promotional gift can be designed with coloured foams. 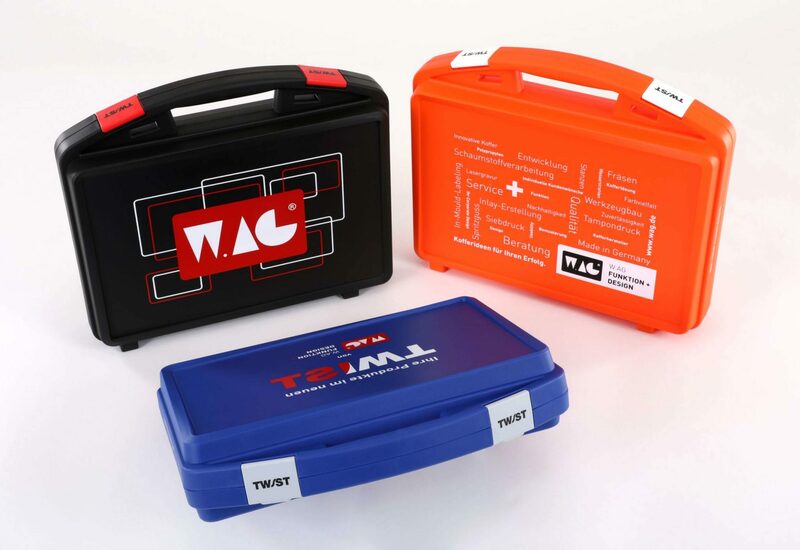 W.AG offers blue and red as standard colours. 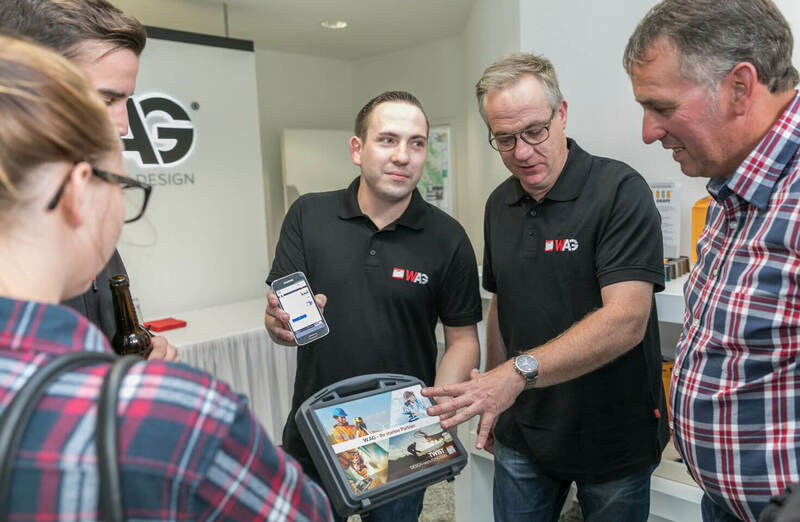 Through the call-to-action info that can be integrated into an IML artwork, the user knows exactly what he needs to do to use Digimarc. 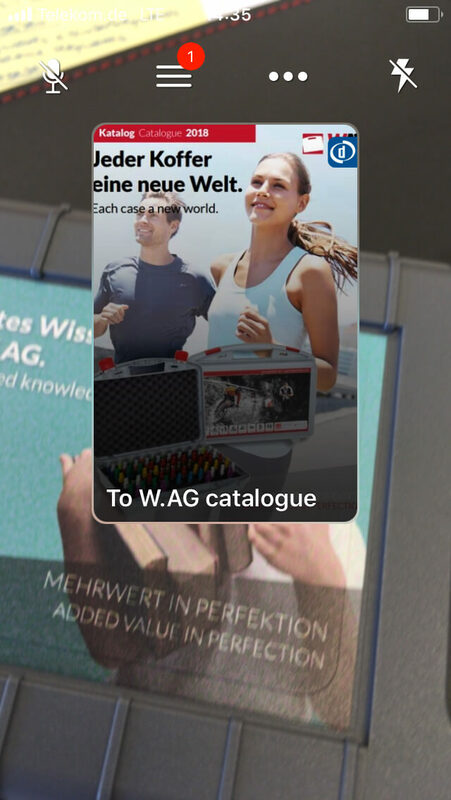 A look at the Digimarc Discover app: the scanned BEAT-IML refers to the W.AG catalogue. 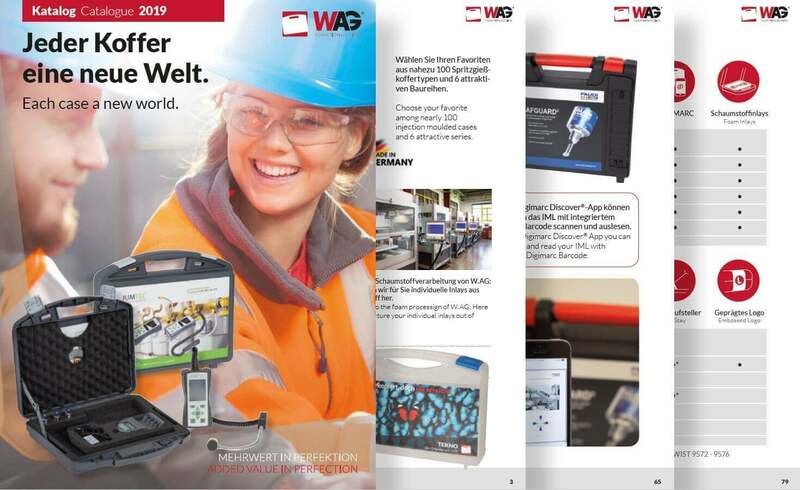 By clicking on the “To W.AG catalogue” element you will be forwarded directly to the PDF version of the catalogue. 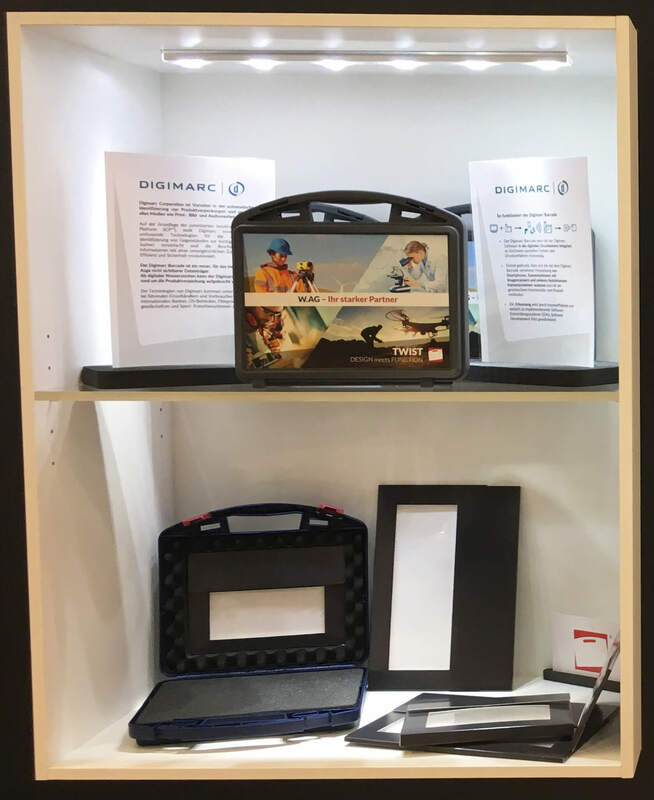 With the Digimarc barcode, links to websites, interactive competitions, product videos and landing pages may be created, or for the download of technical manuals, blueprints, operating and safety instructions. 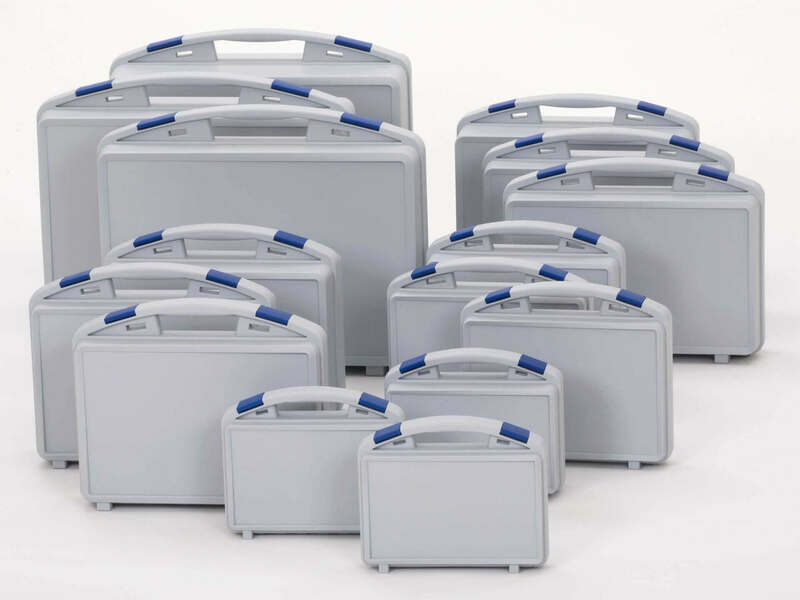 With in-mould labelling, W.AG possibly has the latest innovative decoration process for optical customisation of plastic cases. 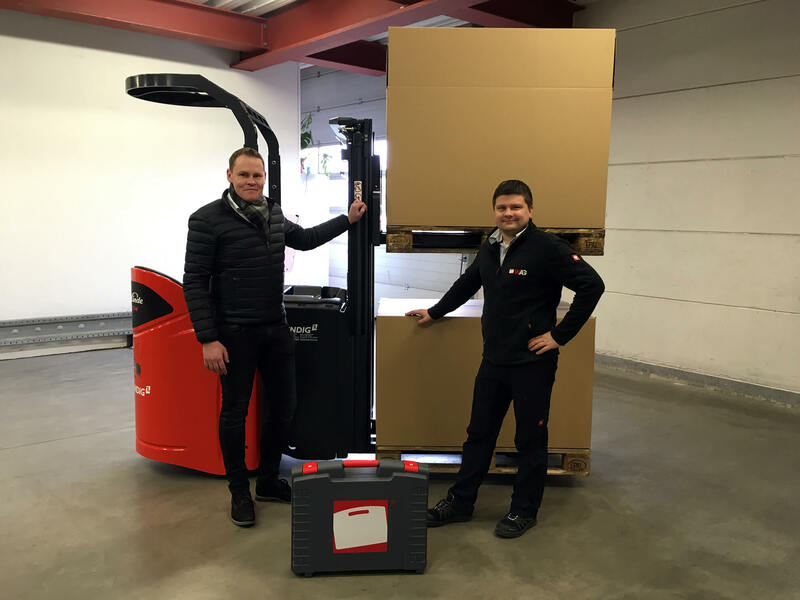 But to give their customers the opportunity to equip their cases with even more intelligence and information, the company is now linking the decoration process with the Digimarc barcode. 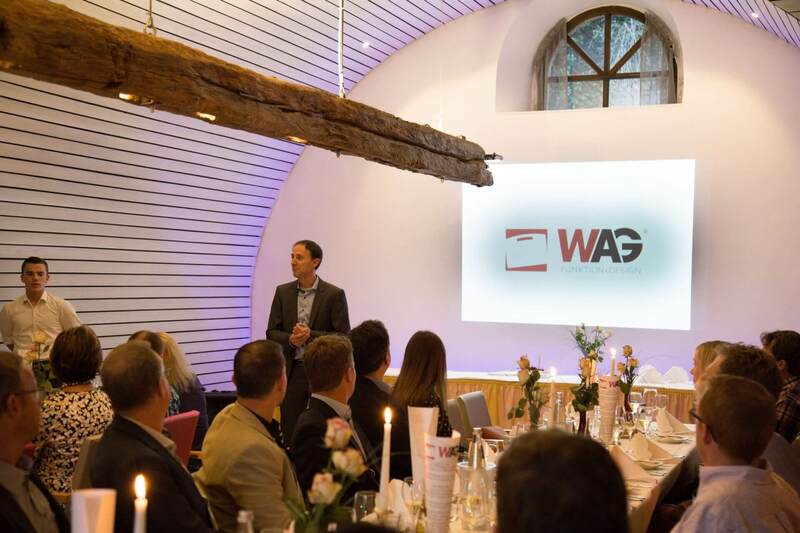 With the integration of this digital watermark, users of W.AG’s design cases have access to a wealth of new functions for marketing, sales, service and process optimisation. 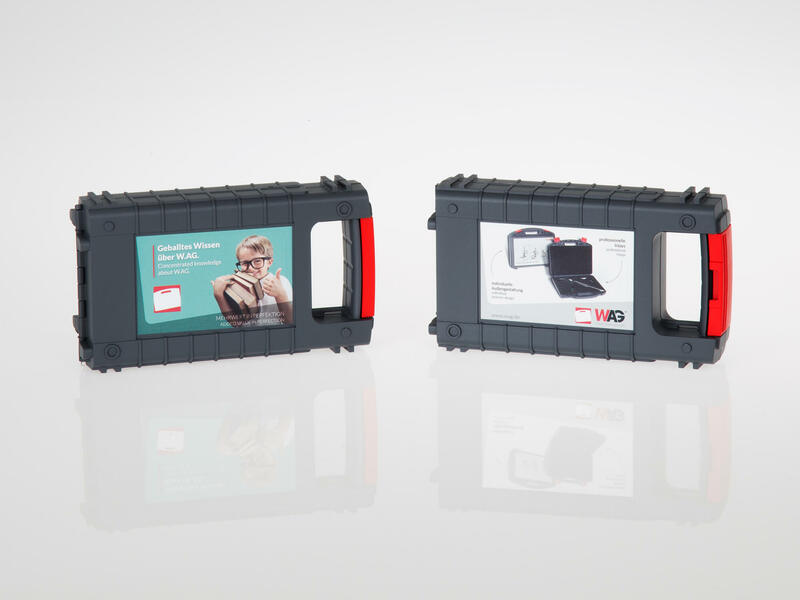 With the symbiosis of in-mould labelling and Digimarc barcode, W.AG offers its customers an innovative solution by combining the currently best printing technology for the creation of brilliant and scratch-resistant colour images on cases with the latest flavour of digital watermark coding (DWC). 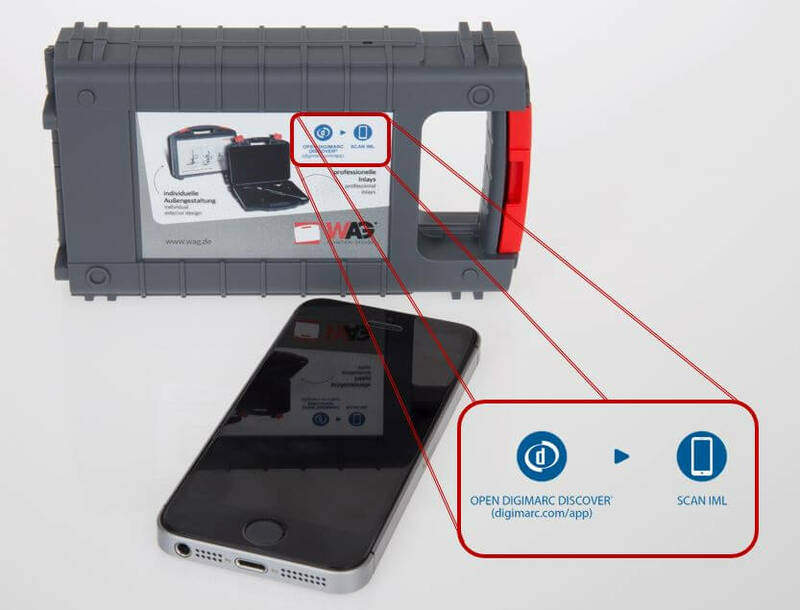 The case user scans the IML motif and, at the same time, the Digimarc barcode with his smartphone. 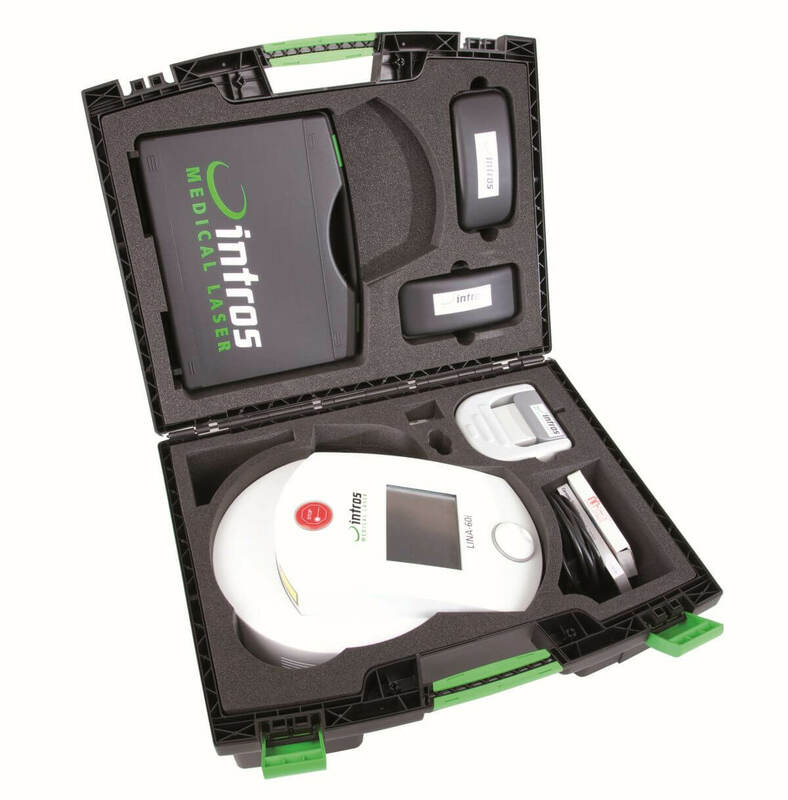 This gives them direct access to the linked pdf, zip, mp3 or video file. 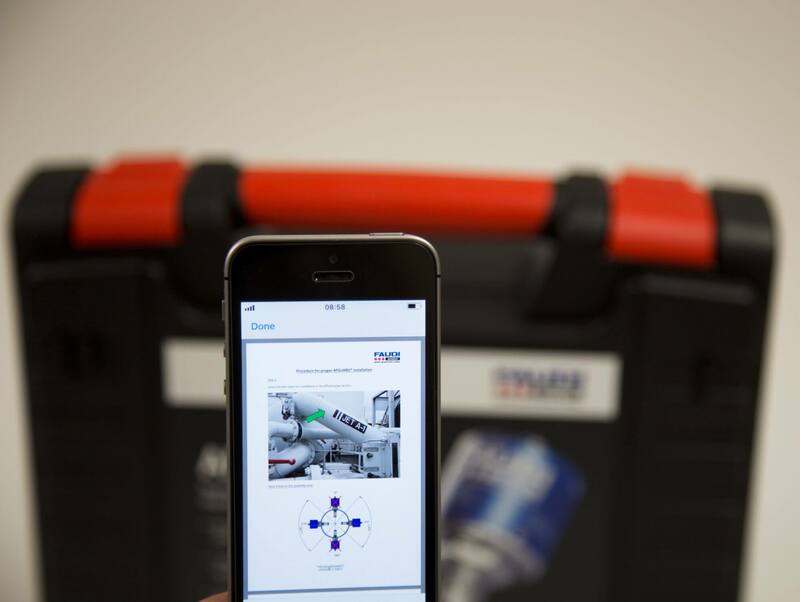 The app for this can be downloaded from the app store or on Google Play for free. 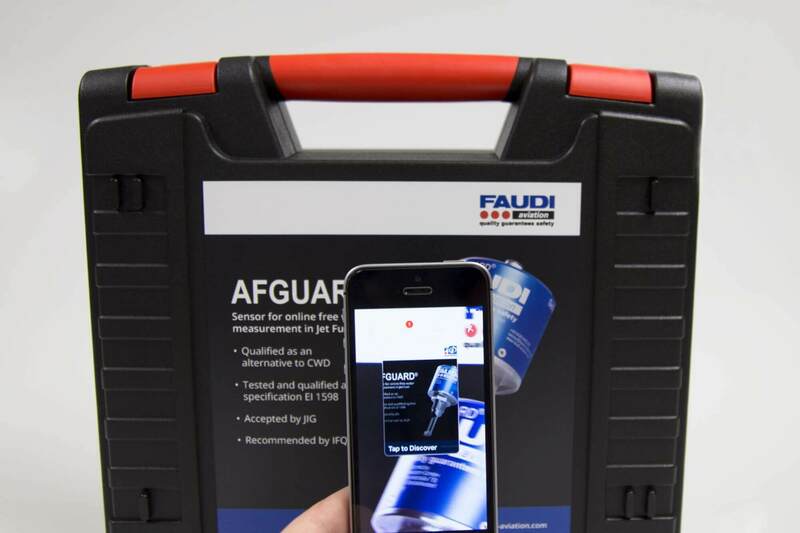 Here an example with a HEAVY case of FAUDI Aviation: After scanning the IML the user loads the instructions via Digimarc Discover App. 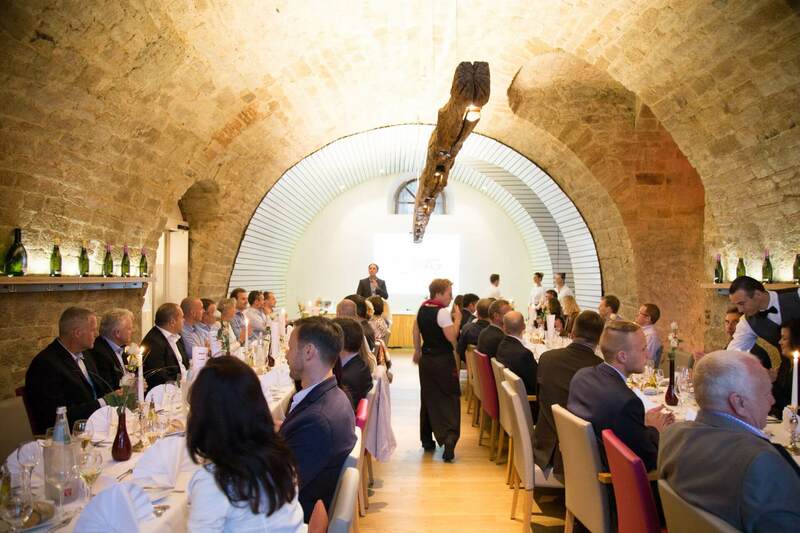 This provides an added value for the customer, because he can open the instructions at a later time by using the activity overview. 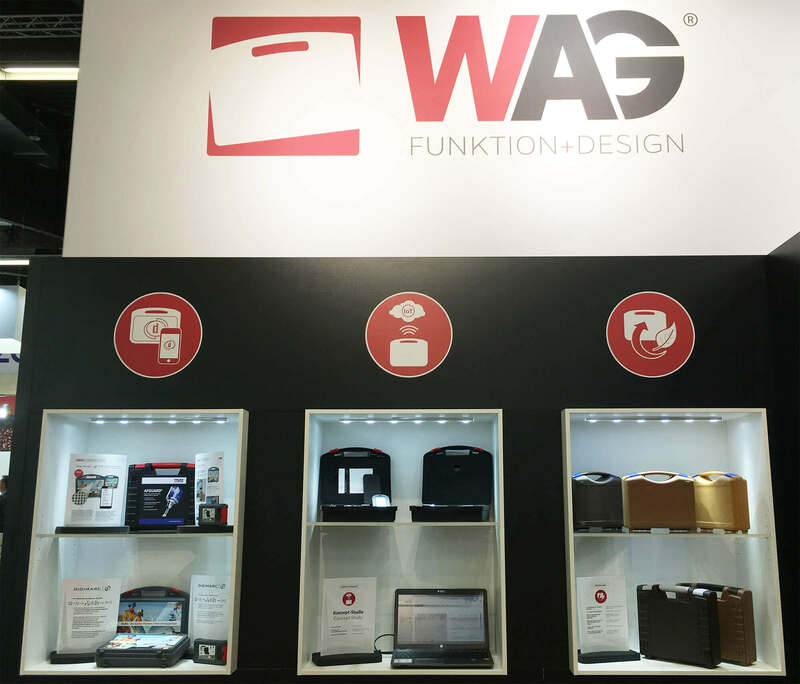 The Digimarc barcode function perfectly corresponds with W.AG’s objective of offering the users of design cases ever more possibilities in value-oriented customisation. 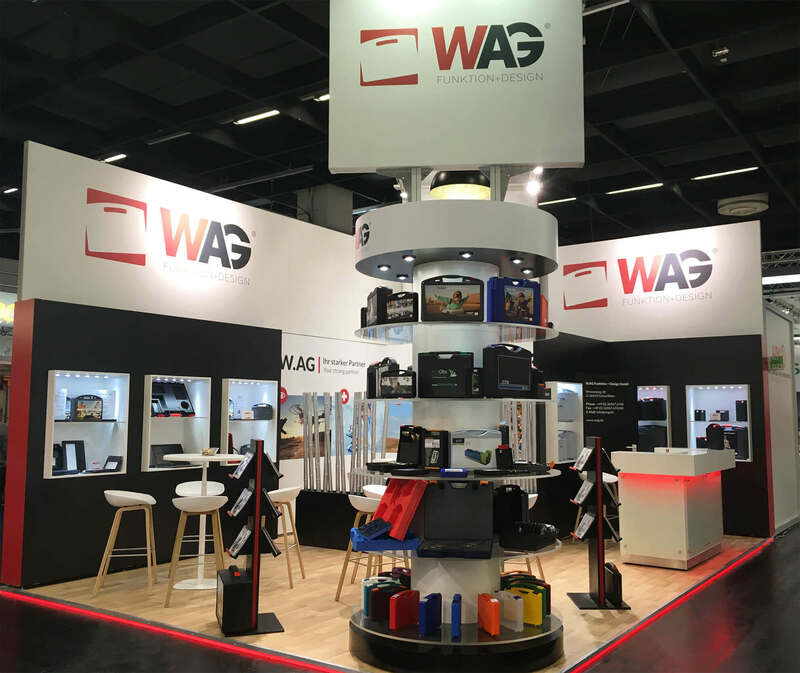 The rotating pylon on the edge of the exhibition stand displayed five levels of numerous customer samples and use examples in different industries. 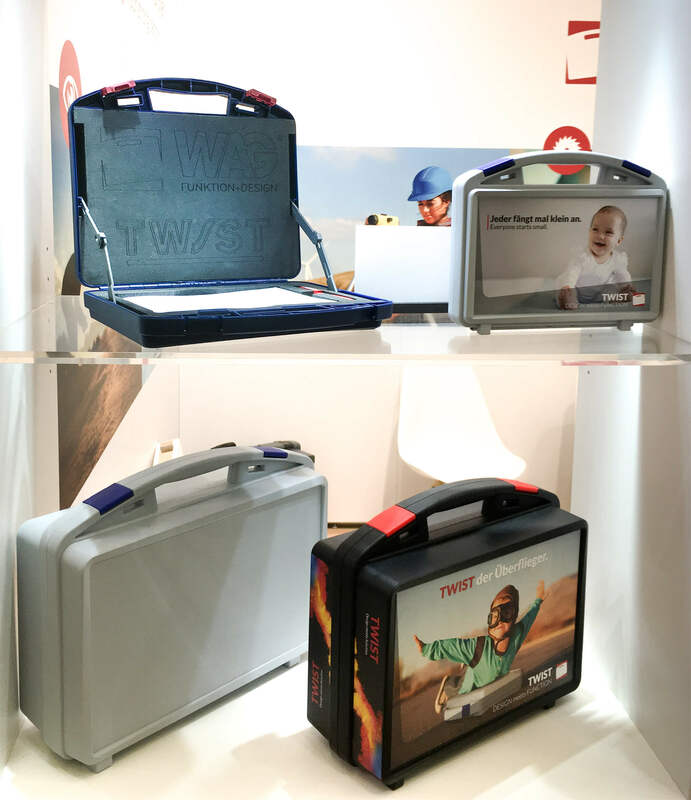 With a view of the meeting area: The TWIST display case displayed IML and inlay solutions on both sides for the TWIST designer plastic case. 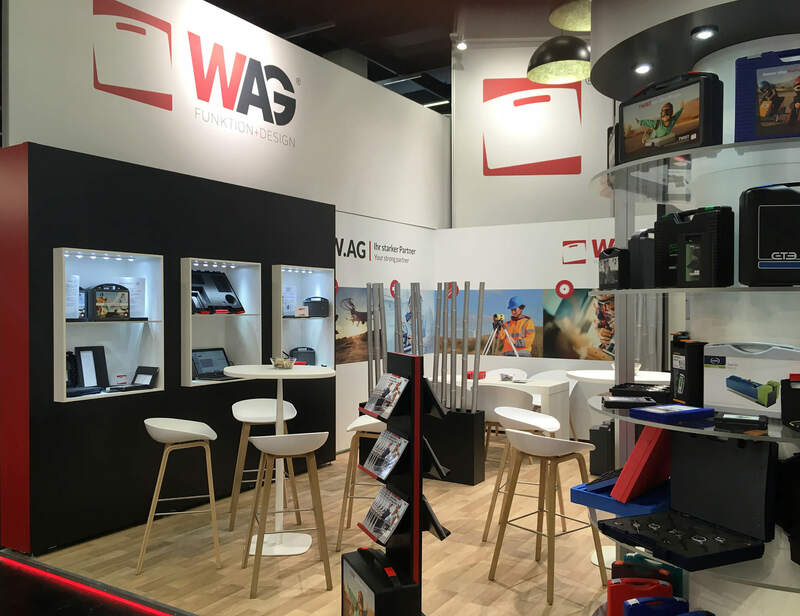 Thanks to the nice furniture arrangement and modern design, the booth concept provided an inviting atmosphere from the side. 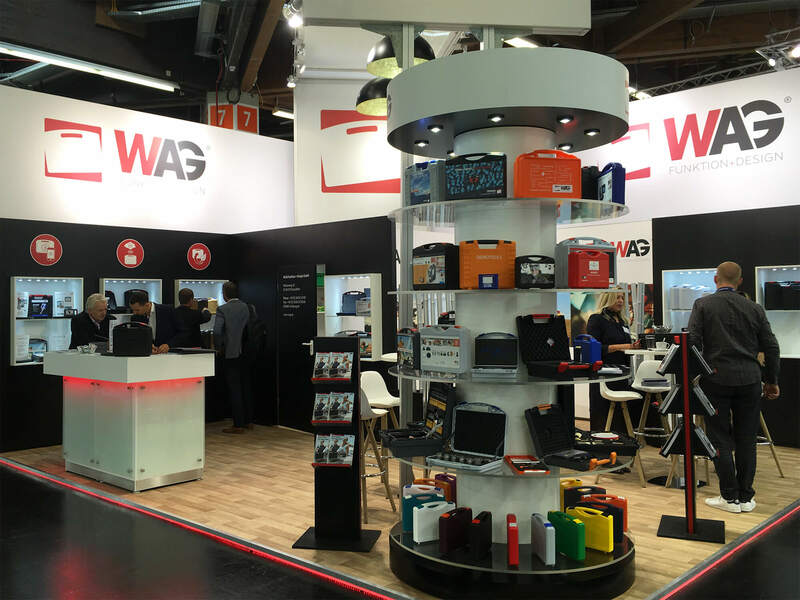 In the display cases on the right side of the booth, W.AG exhibited TEKNO, BEAT, JAZZ and HEAVY cases in narrow, deep and combined half-shells. 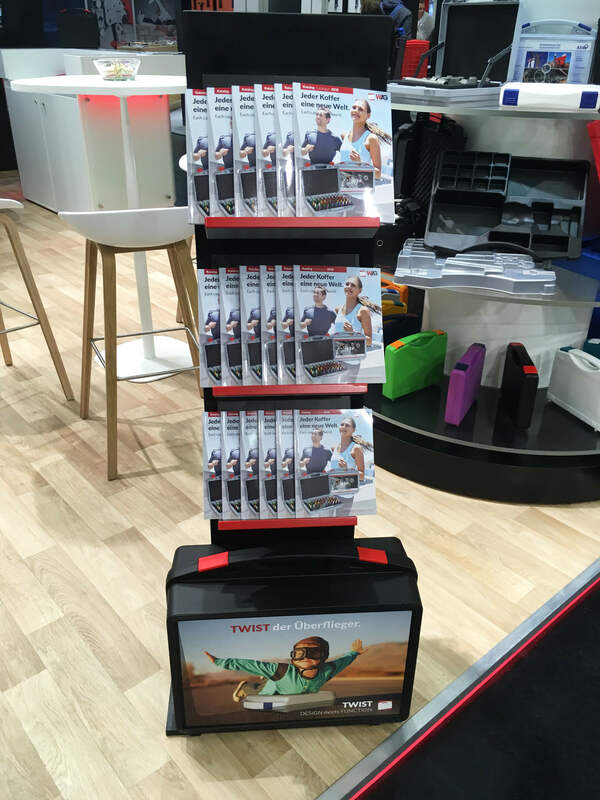 All good things come in threes: the innovation and concept display cases are arranged side by side. 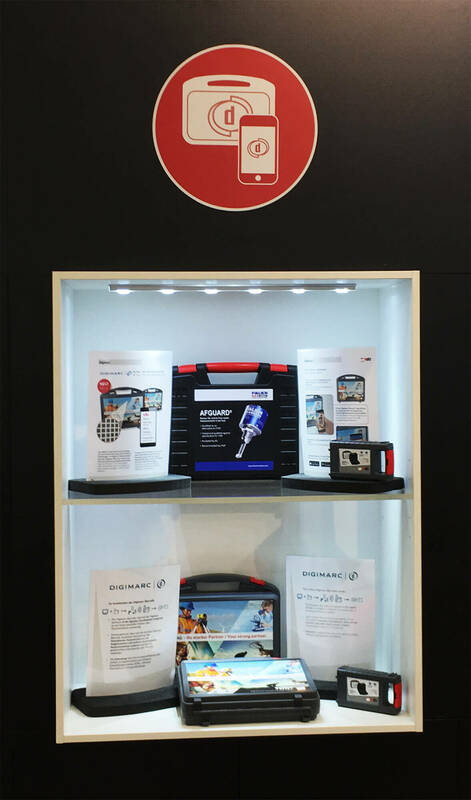 In the first display case, W.AG displayed the Digimarc barcode which can be used in combination with IML. The barcode is integrated into the IML artwork. 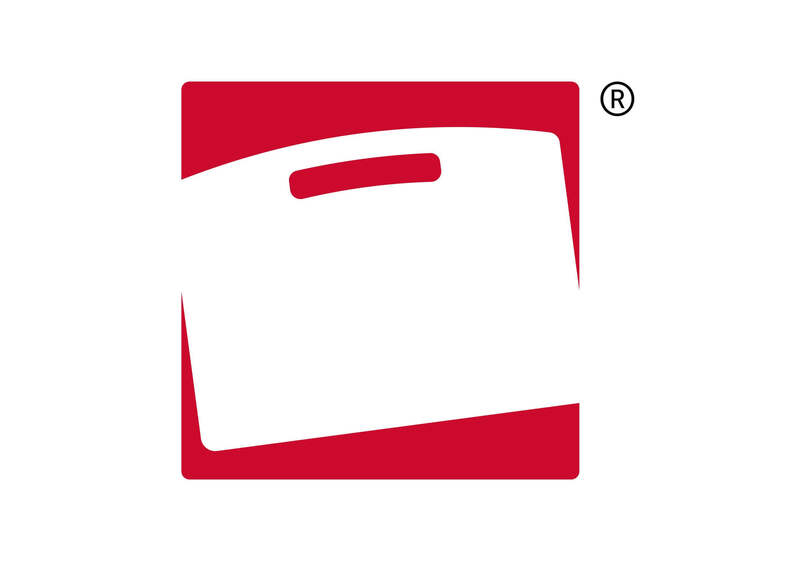 This makes the IML scannable with the Digimarc Discover app and allows you to access digital content. 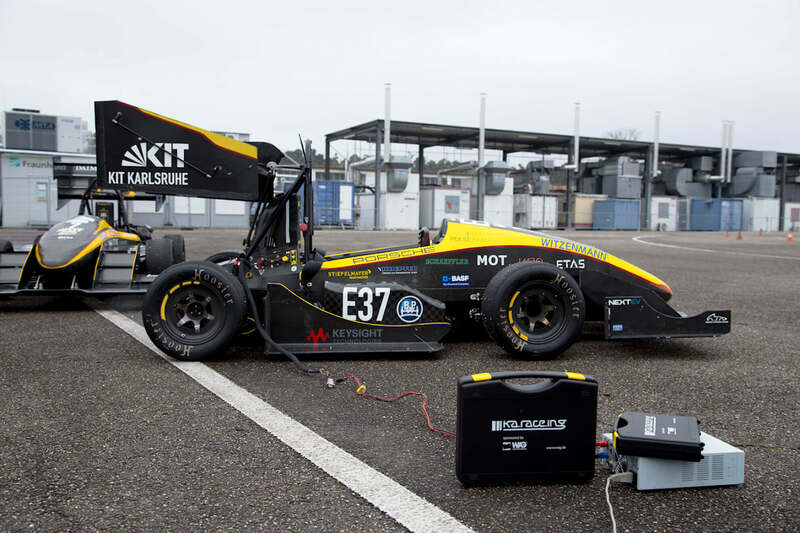 The “Smart Cases” IoT concept study showed two application examples with GPS trackers that are networked via a cloud platform. 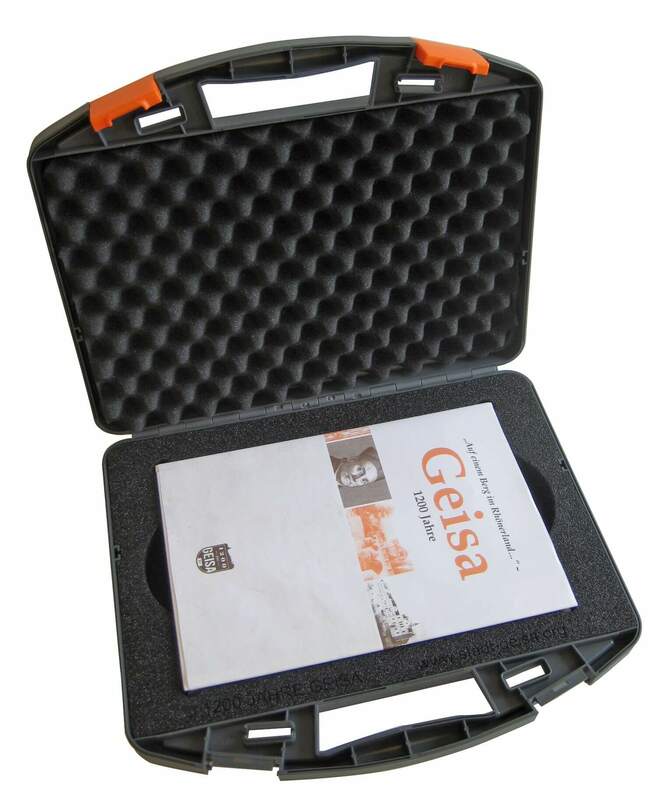 This allows you to record the location of the plastic case and the environmental conditions in the plastic case. 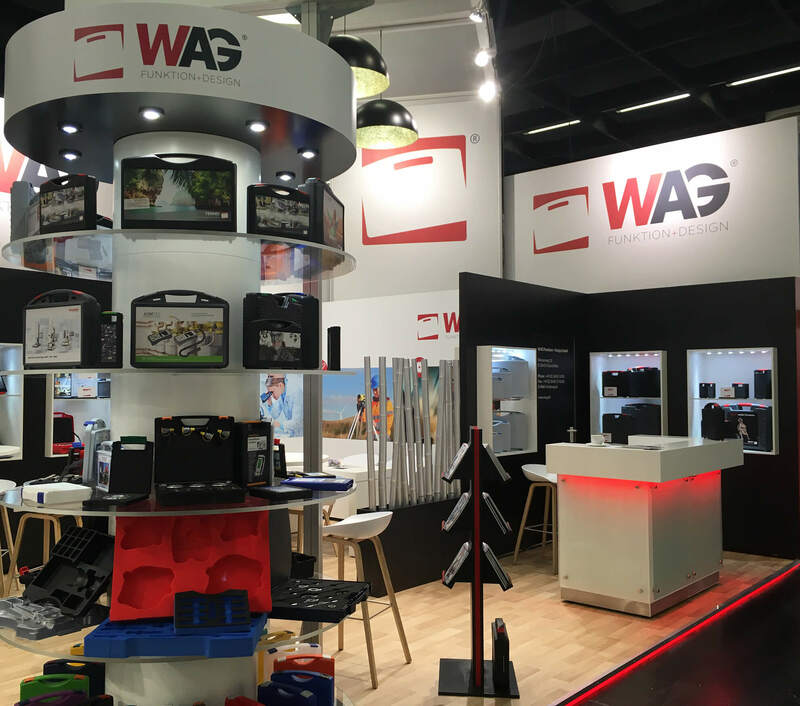 Premiere at the FachPack: W.AG publicly debuted its bioplastic case made of 50% organic plastic. 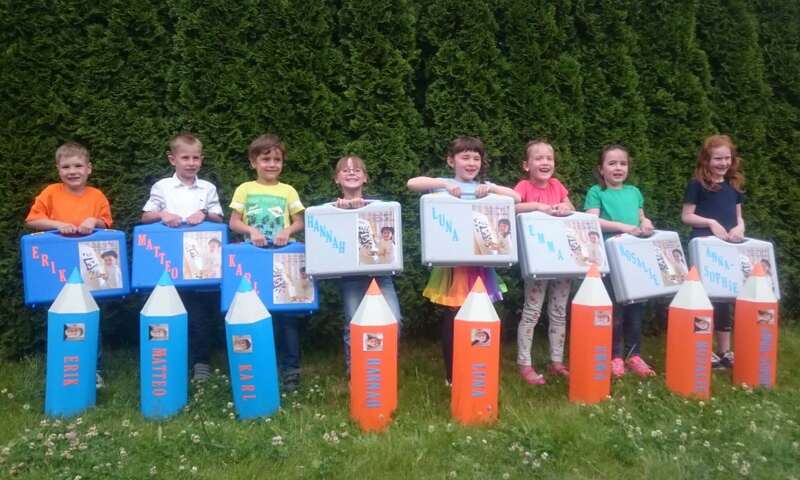 W.AG made its first attempts the year prior. 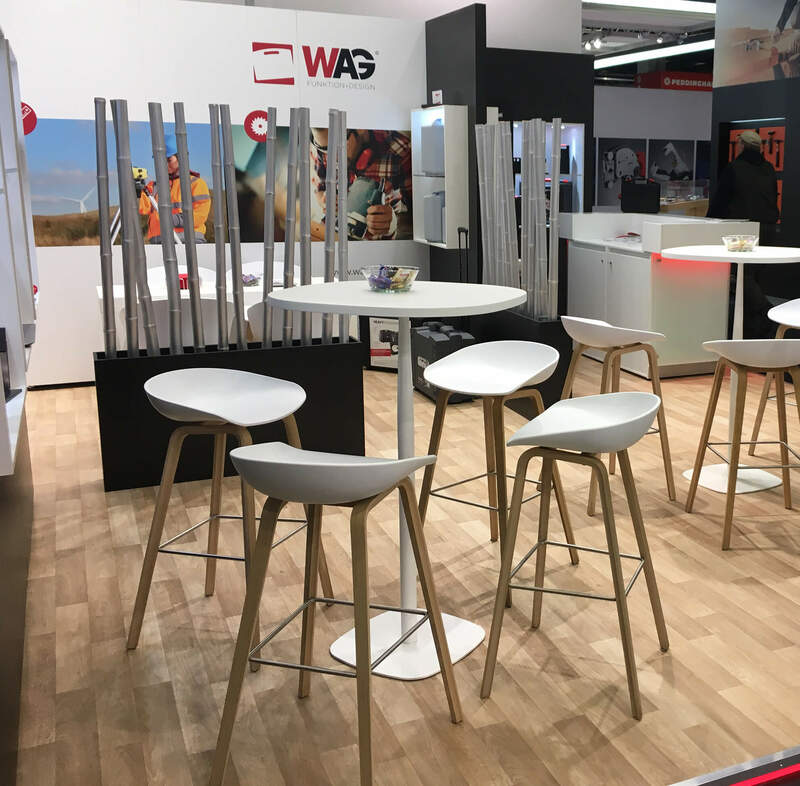 At FachPack 2018, W.AG exhibited the beautiful wood colours of coconut, beech and spruce for a refined wood look. 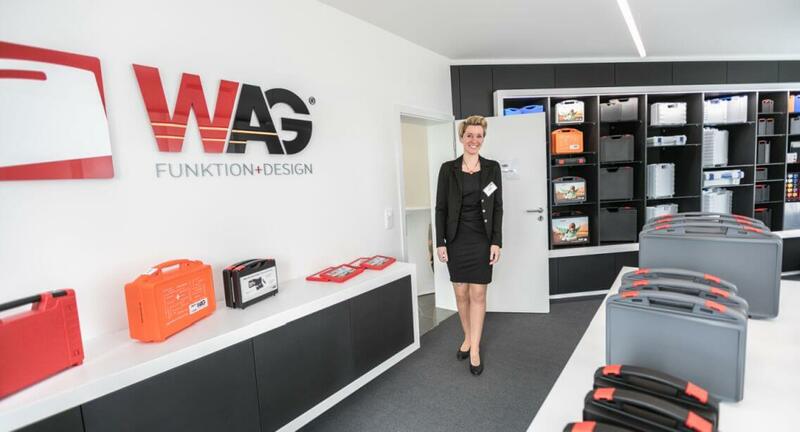 Plastic manufacturer W.AG is paying close attention to the production of customised inlays. 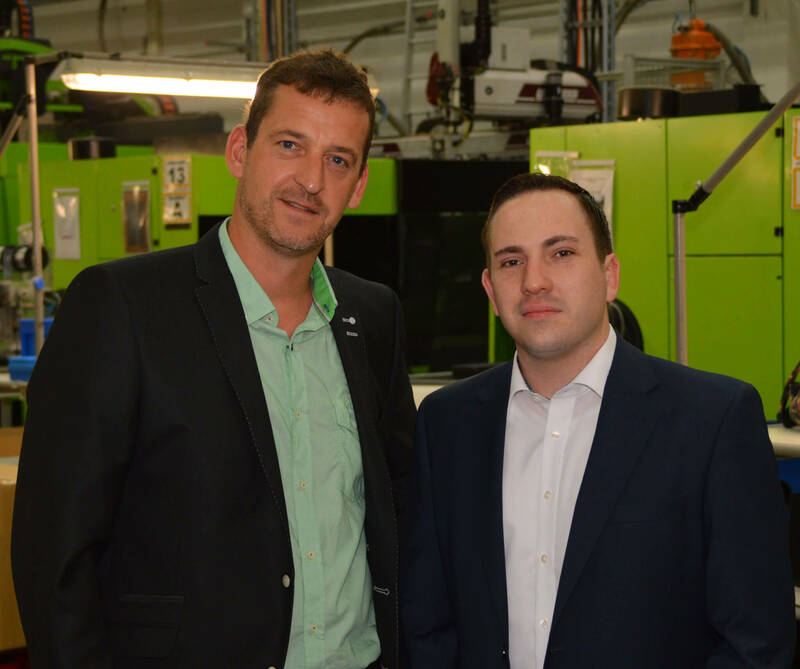 As the processing and handling of modern foams plays a key role, the company has invested in two new CNC milling machines. 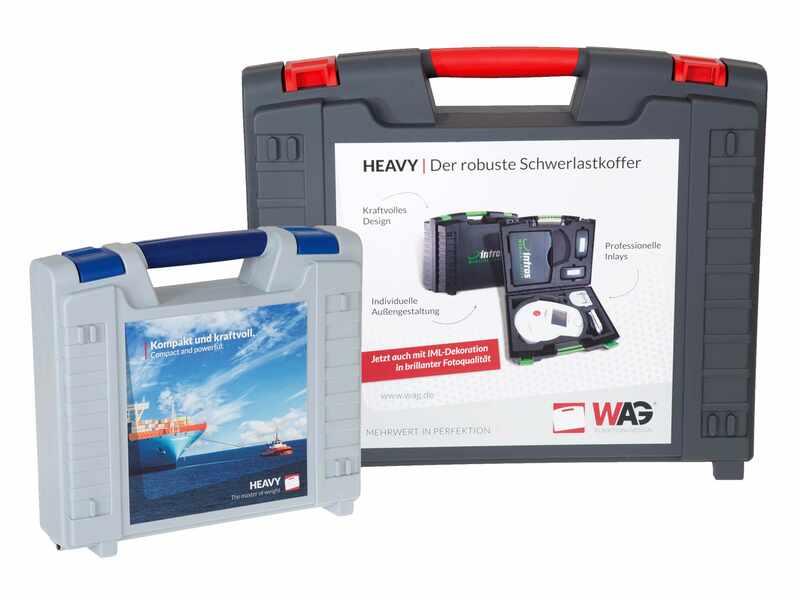 As a premium manufacturer of product and customer-specific plastic design cases, W.AG also pays great attention to the production of customised inlays. 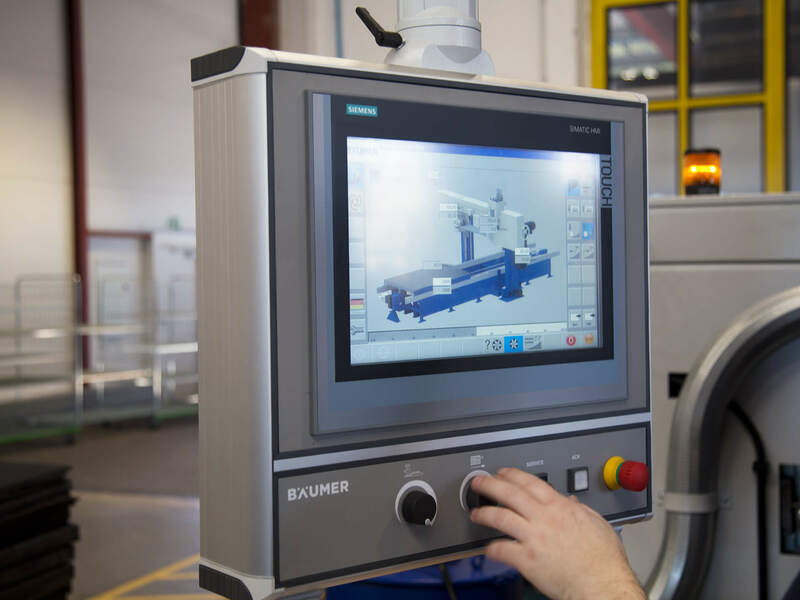 As the processing and handling of modern foams plays a central role in this, the company has invested in two new CNC milling machines which are currently being put into operation. 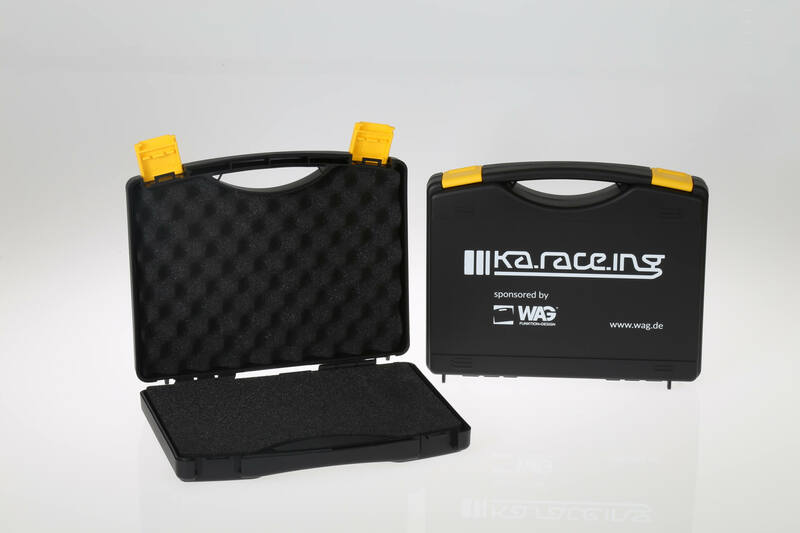 In addition, W.AG now offers the possibility to produce inlays made of coloured foam sheets and to equip the case lids with functional cardboard pockets. 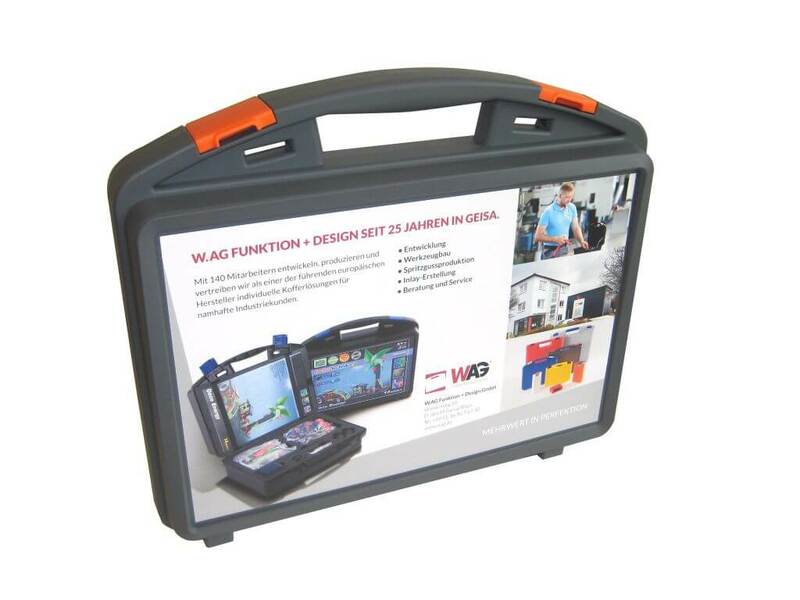 W.AG is now also offering the opportunity to further enhance the functionality of the interior design of its cases by integrating additional cardboard pocket solutions. 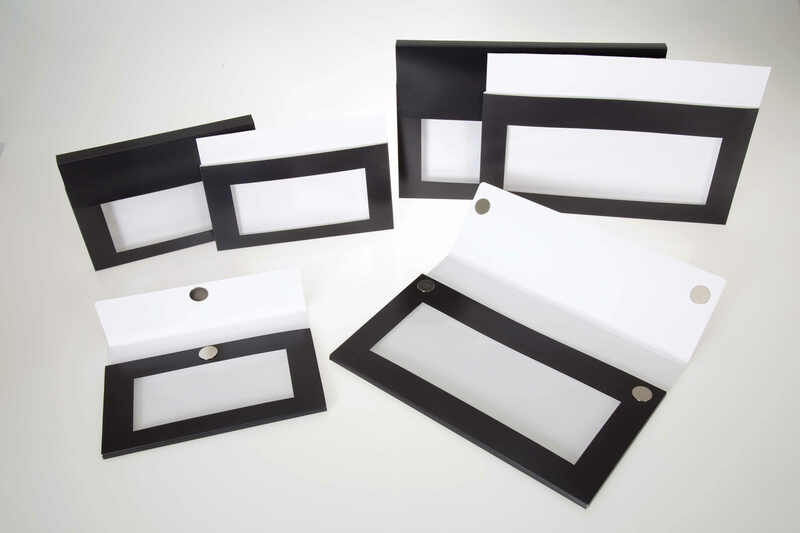 The anthracite coloured pockets are available in numerous designs. 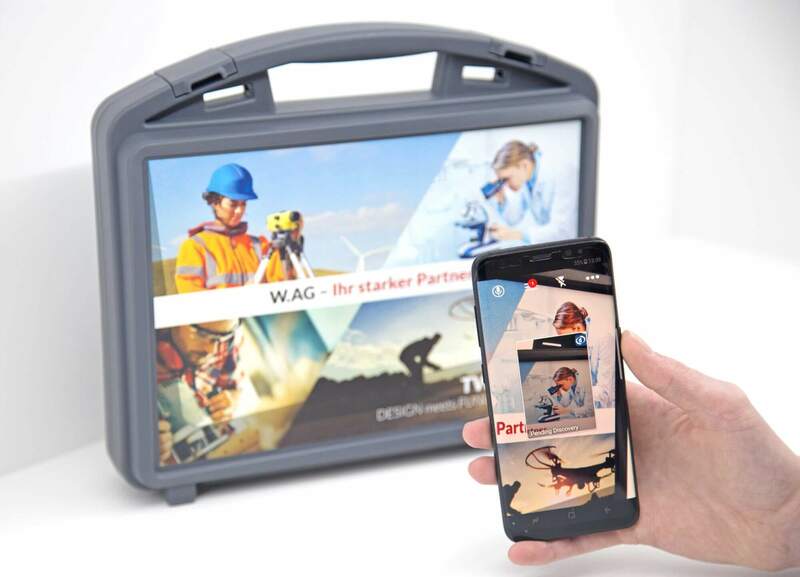 The new cardboard pockets from W.AG feature a window made of transparent film and are inserted into the lid or upper shell of the case. 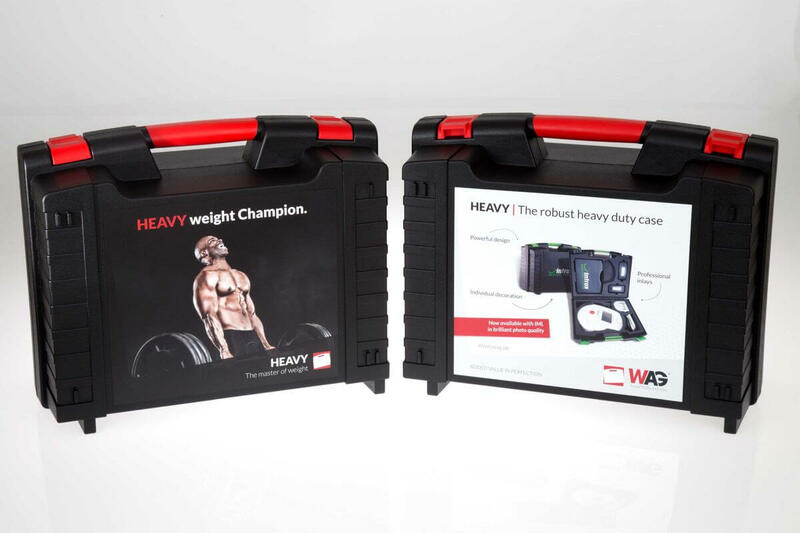 They are available as an open top version, containing a flap with or without magnetic clips and in A4 and A5 format with 5.0 or 15 mm depth. 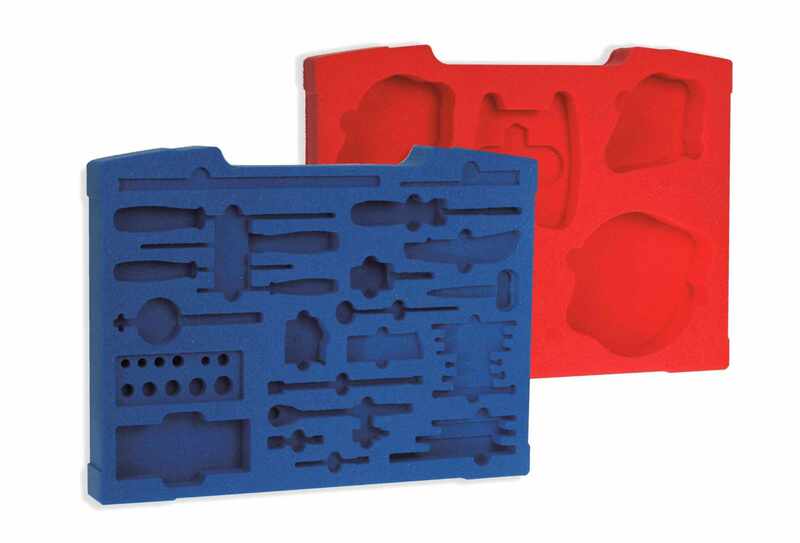 For the coloured sheet foams, the customer initially has the choice between red and blue; as an option, many other colours are also available for the foam inlays. 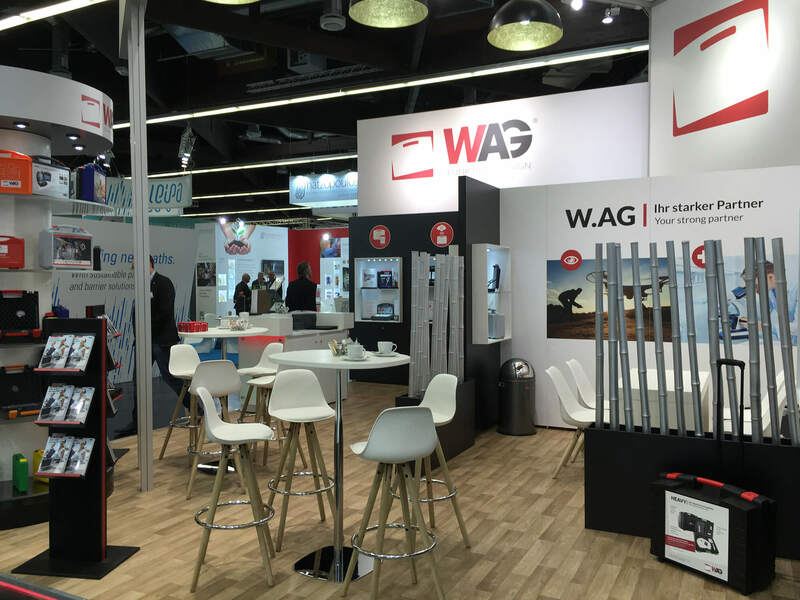 The new exhibition stand is analogous to the new corporate design of W.AG. 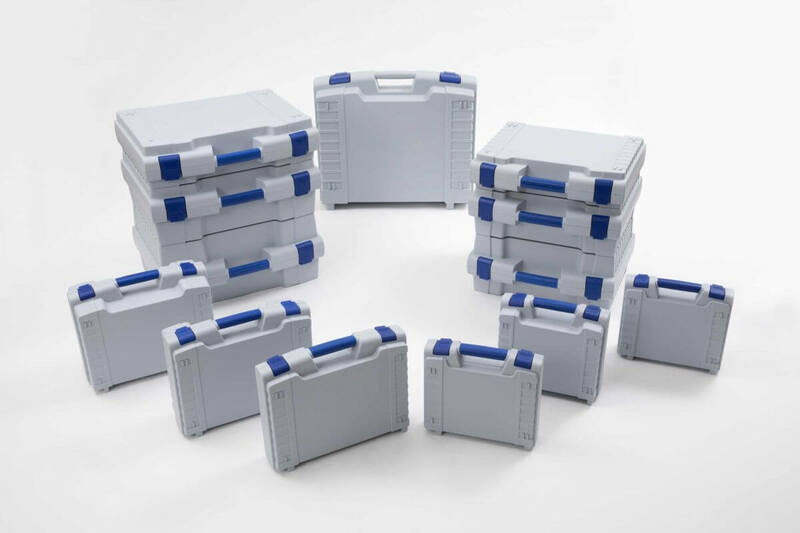 Digital case innovations, new pocket solutions and other in-mould labelling (IML) compatible case sizes. 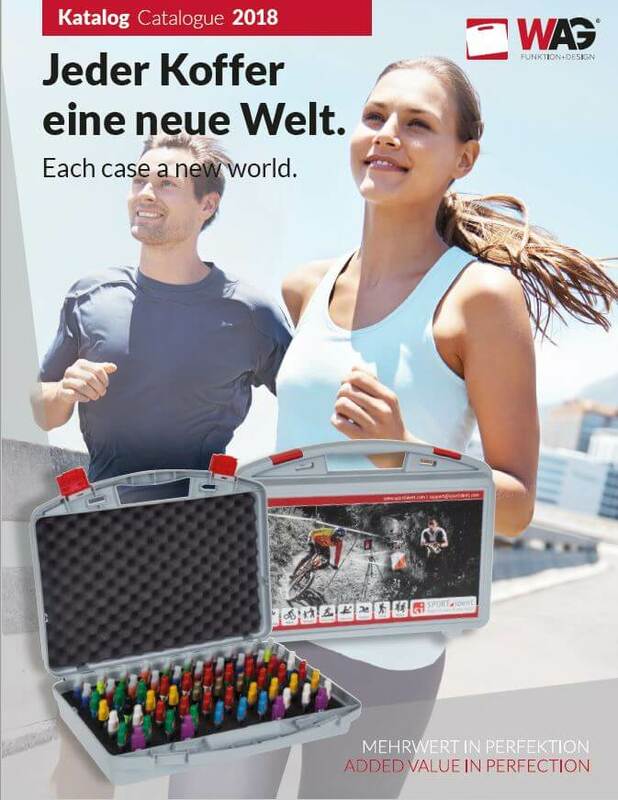 From 04/03 until 07/03/2018, the International Hardware Fair took place in Cologne with more than 2,700 exhibitors from 55 countries. 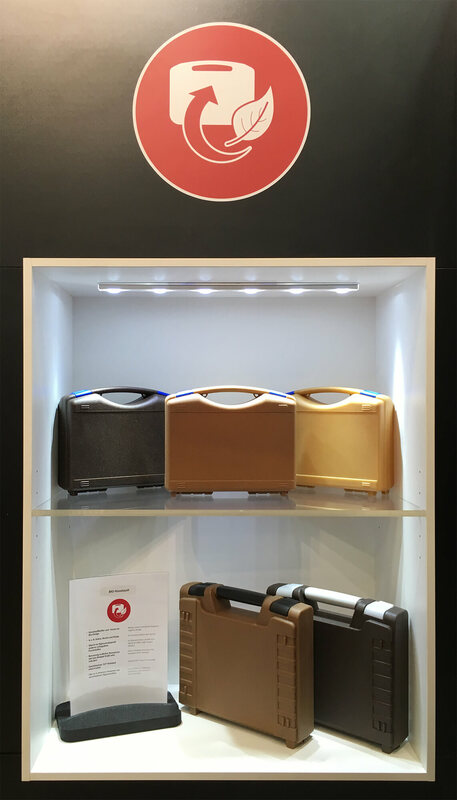 Case manufacturer W.AG Funktion + Design presented a new stand concept at stand C020/D021 in Hall 10.1 and featured some new concepts from the Geisa “plastic case universe”. 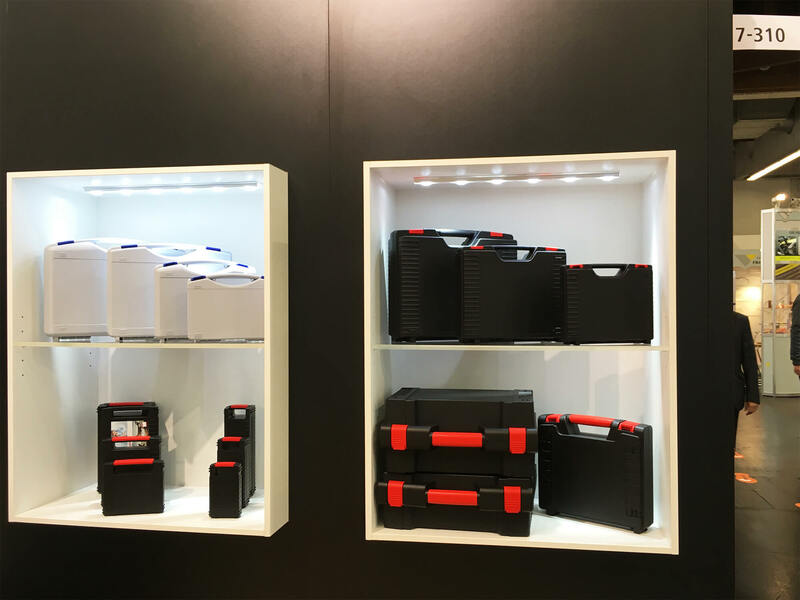 A view of the new exhibition stand from the left: The white and black backgrounds optimally contrast and the colourful cases and features. 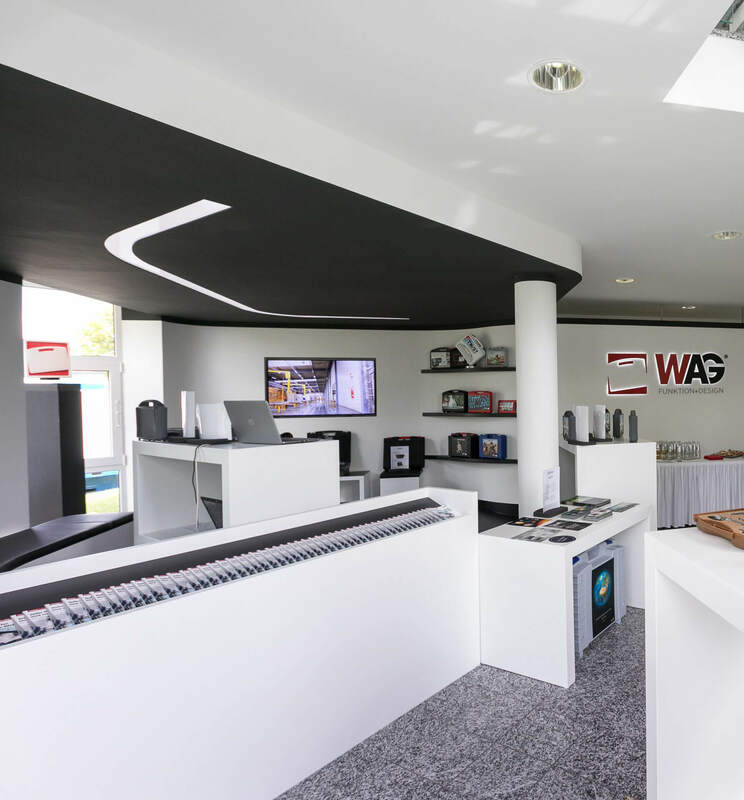 The pylon caught the eye of many visitors with its entire W.AG product and service spectrum. 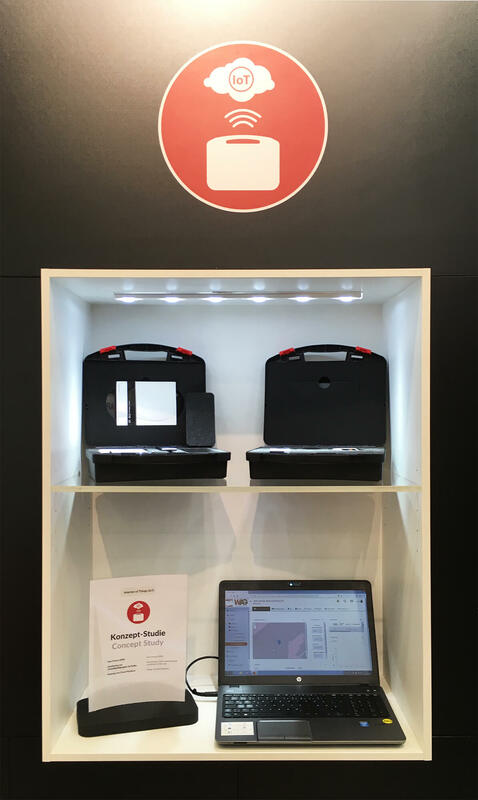 The new display cases and furniture rounded off the booth concept. The fresh wood aesthetic of the furniture and floor lent a welcoming and sympathetic feel. 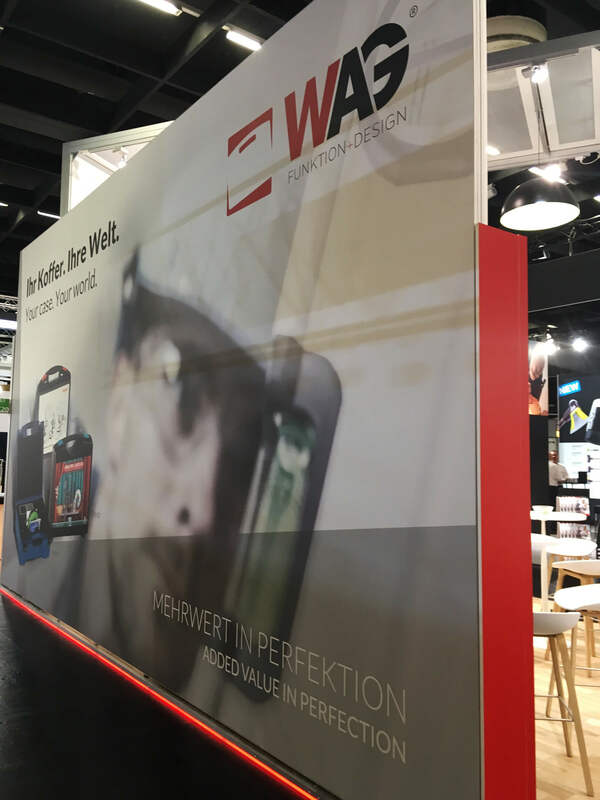 The image banner on the back wall of the exhibition stand was a showstopper unto itself. Above: The imperceptible Digimarc Barcode. 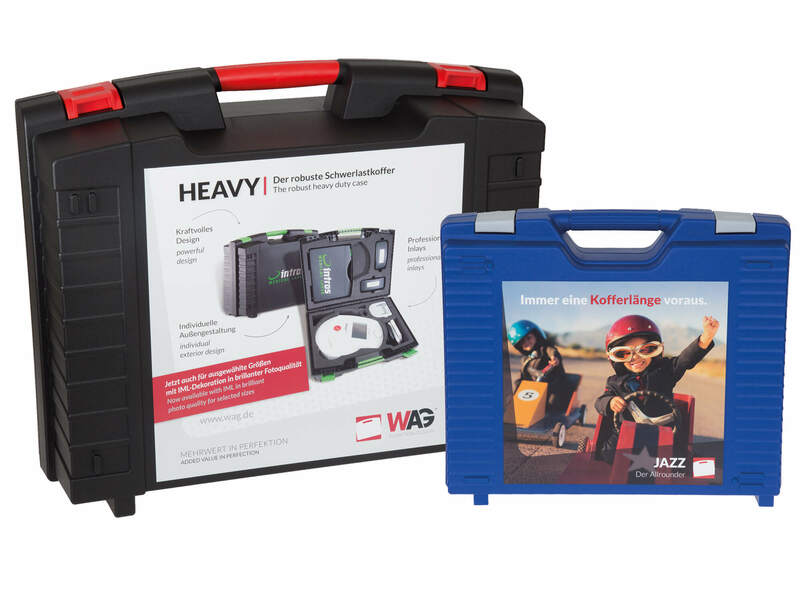 Bottom: The new pocket solutions from W.AG in A5 and A4 format. 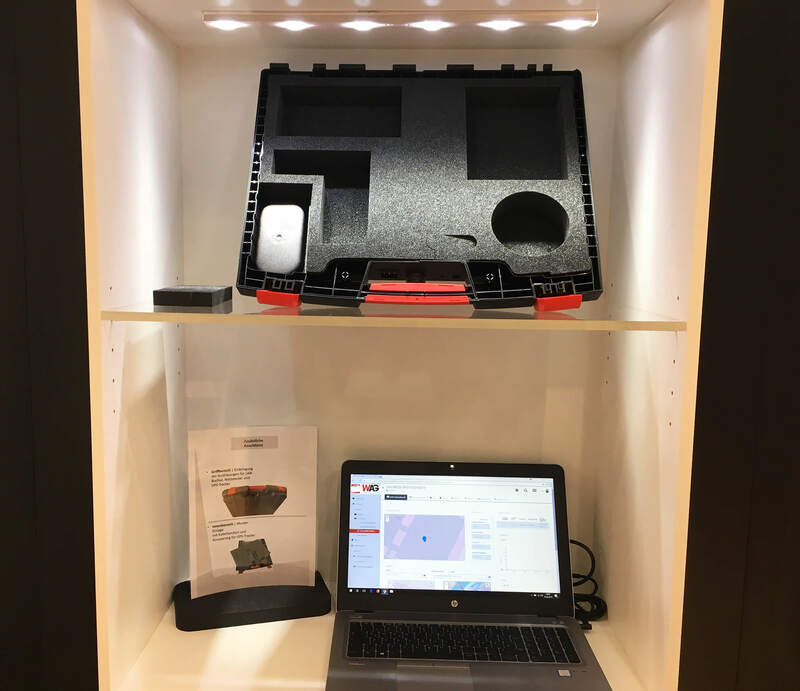 The IoT display case: the presentation of the Internet of Things study with a tracker and cloud solution. 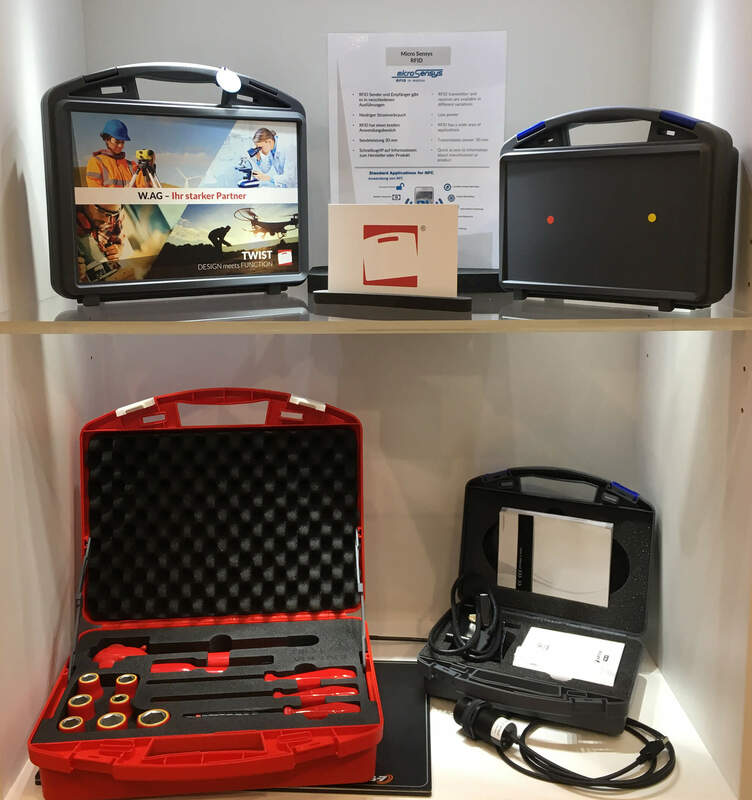 The NFC/RFID display case: Visitors learned about the possible uses of NFC chips and RFID sensors. 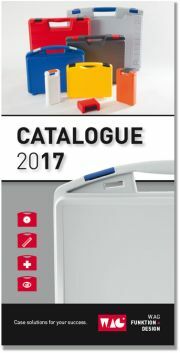 W.AG custom catalogue and brochure stands were produced for the new stand concept. 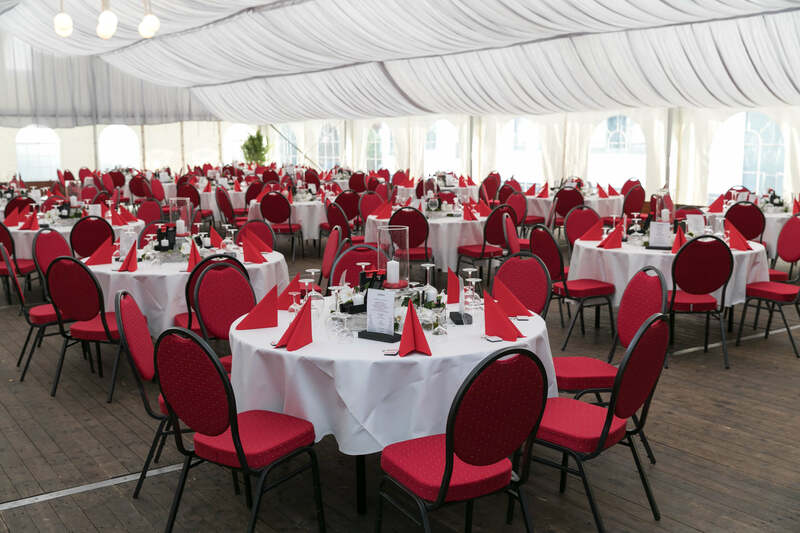 The Hotel-Restaurant Bachmühle in Fulda welcomed all guests with a professional decoration. 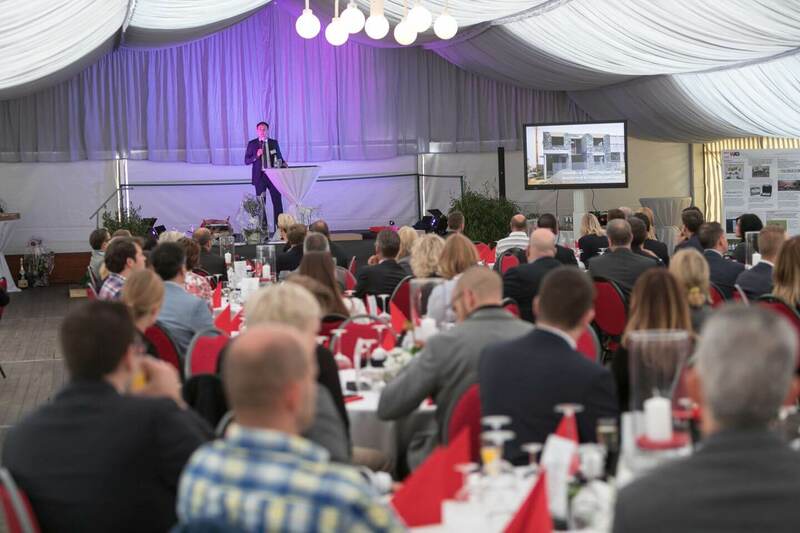 Managing director, Konrad Goldbach, warmly welcomed all guests. 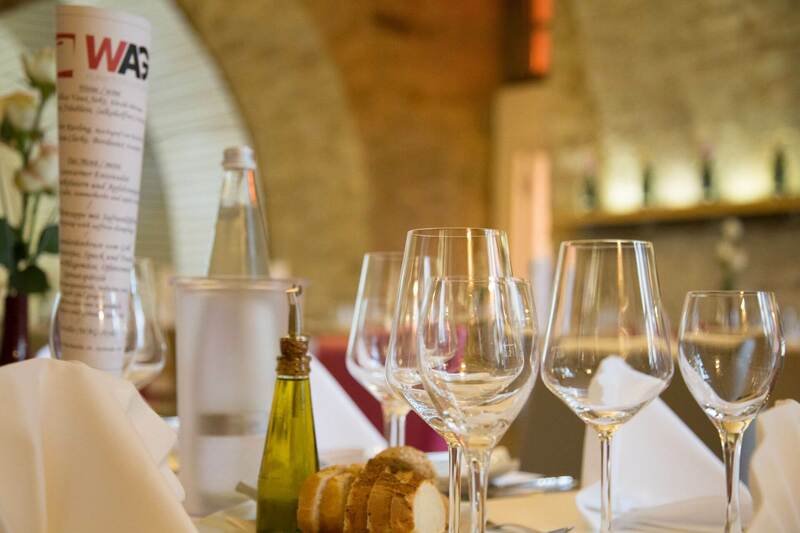 The Bachmühlen team served an excellent meal of great food and refreshing beverages. 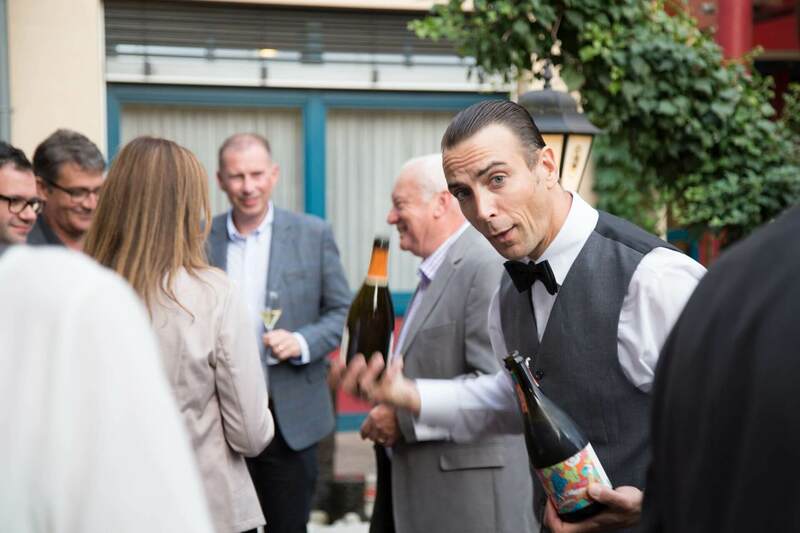 The highlight of the evening was the comedy waiter Ullich Steybe who created a relaxed atmosphere. 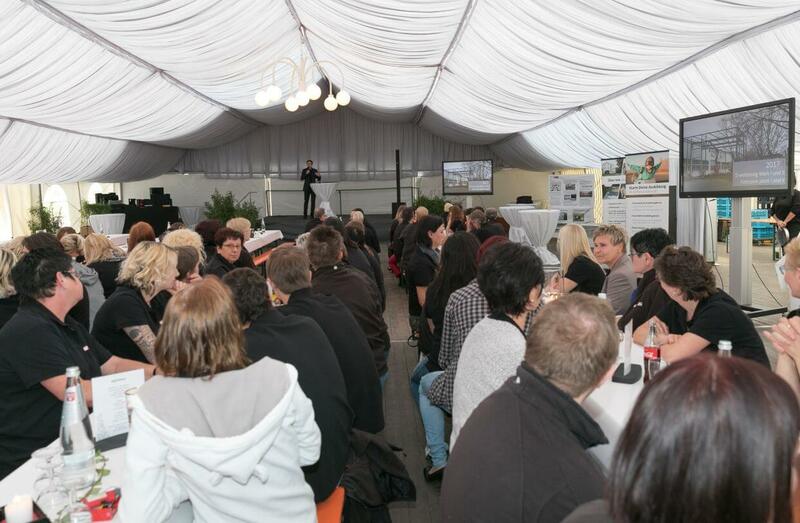 W.AG welcomed the guests in the festive marquee. 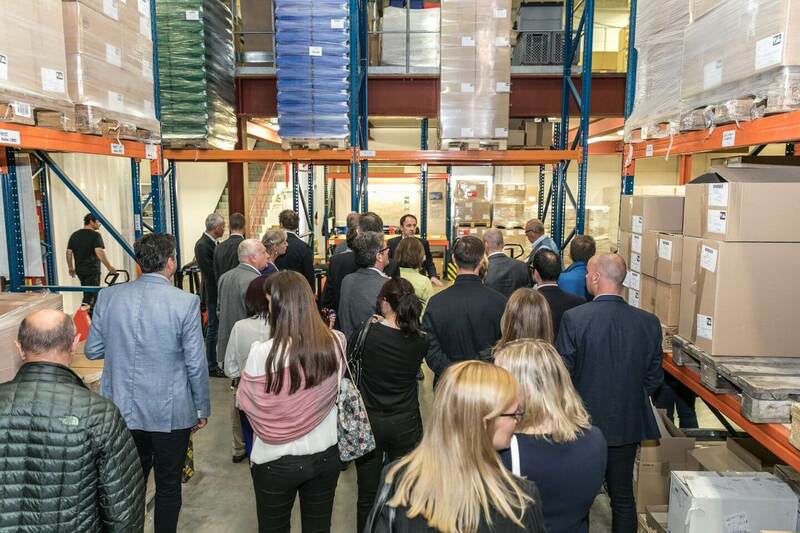 Several product exhibitions concerning current trends were waiting for the guests. 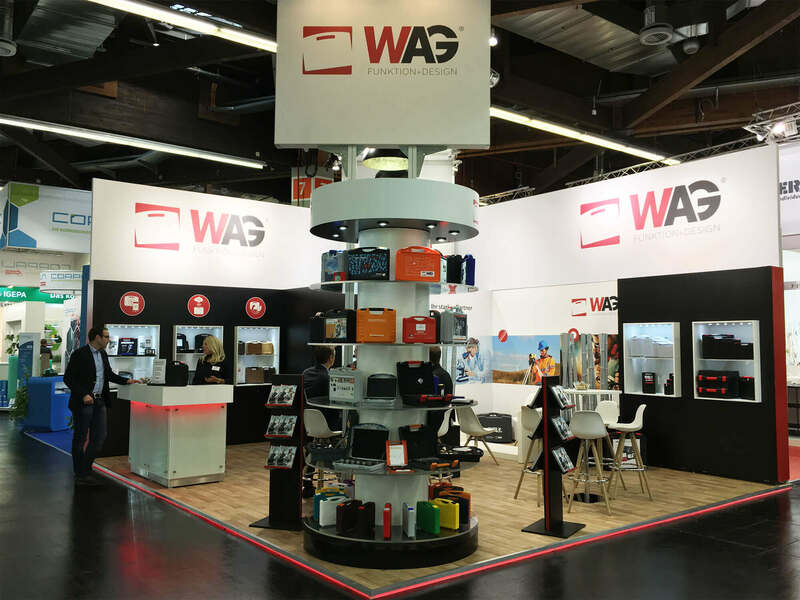 One of the product exhibitions showed all plastic case series of W.AG including all decoration methos like in-mould labelling, screen and pad printing. 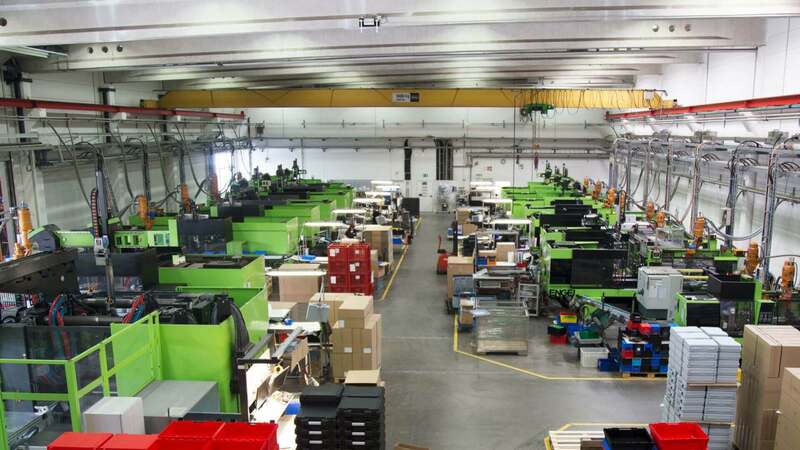 … foam processing, milling, laser engraving and water-jet cutting. 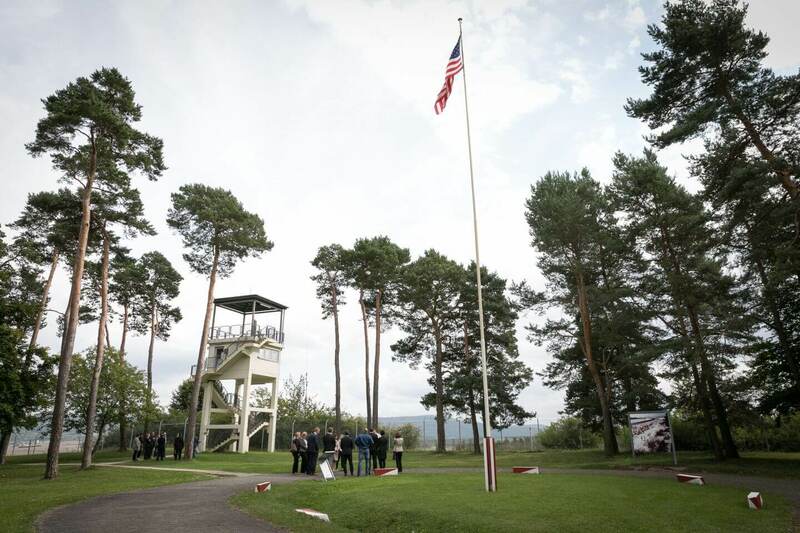 Guest had the chance to take a tour at the authentic historical site “Point Alpha Memorial” that gave deep insights about the history of the region. 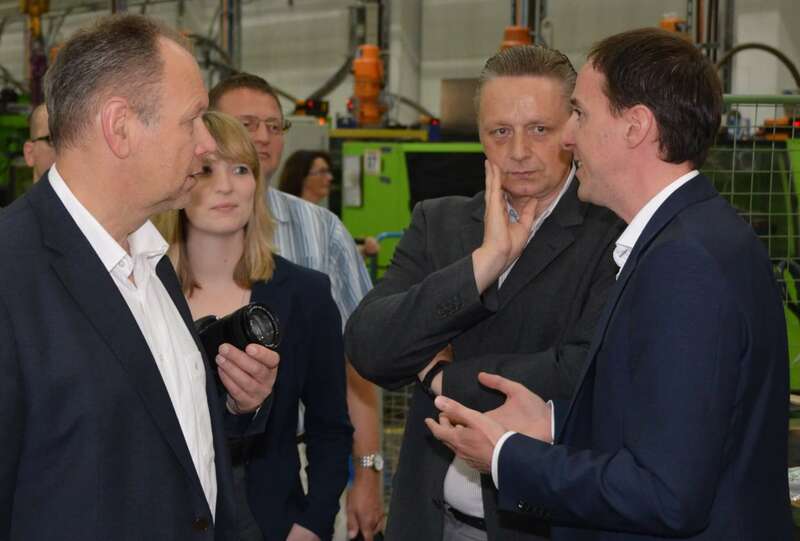 …and informed the employees about future goals the further orientation of the company. 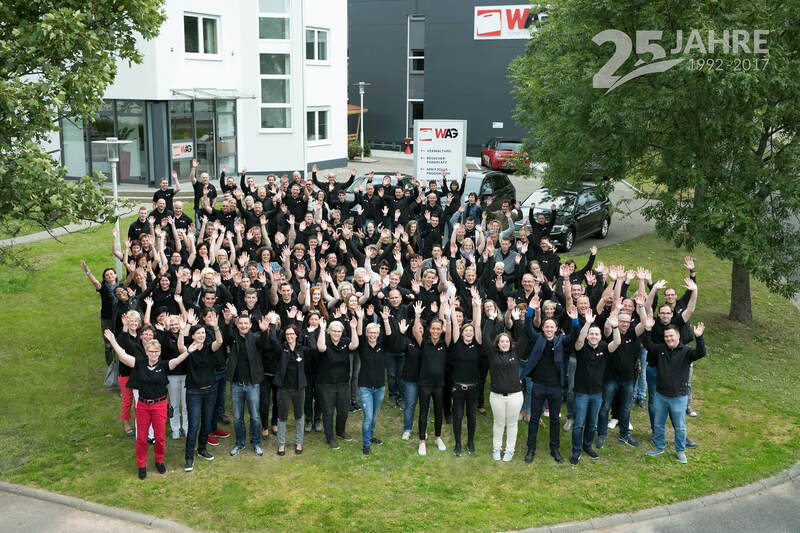 The 150 employees of the plastic case manufacturer celebrated 25 years W.AG Funktion + Design. 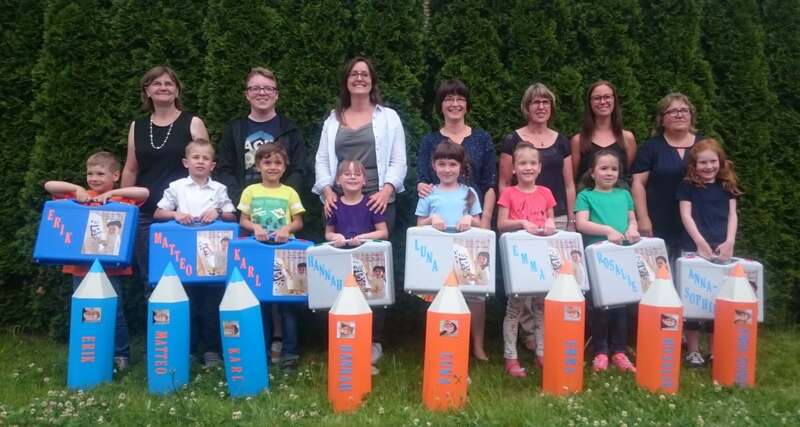 Starting at 2.00 p.m. the doors were opened to the families and members of staff. 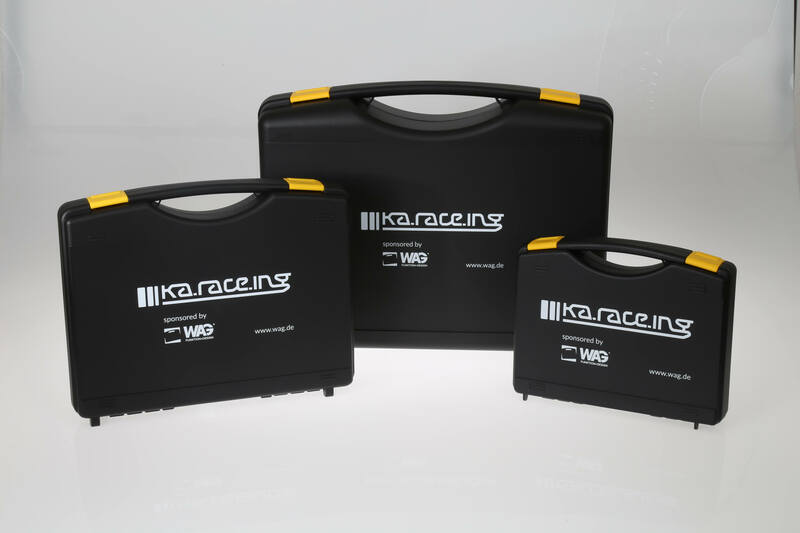 Individual case solutions with an unique design and customized case-inlays. 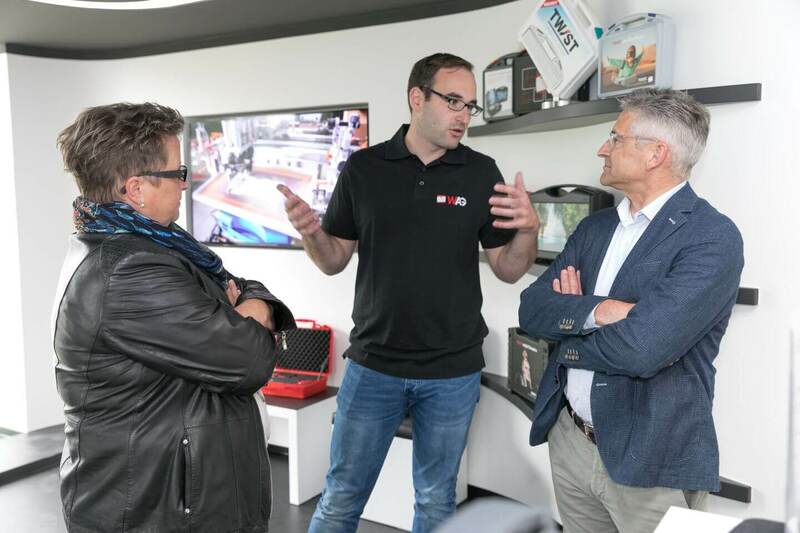 Product manager, Björn Ullrich, answered all the guest’s questions at the product exhibition. 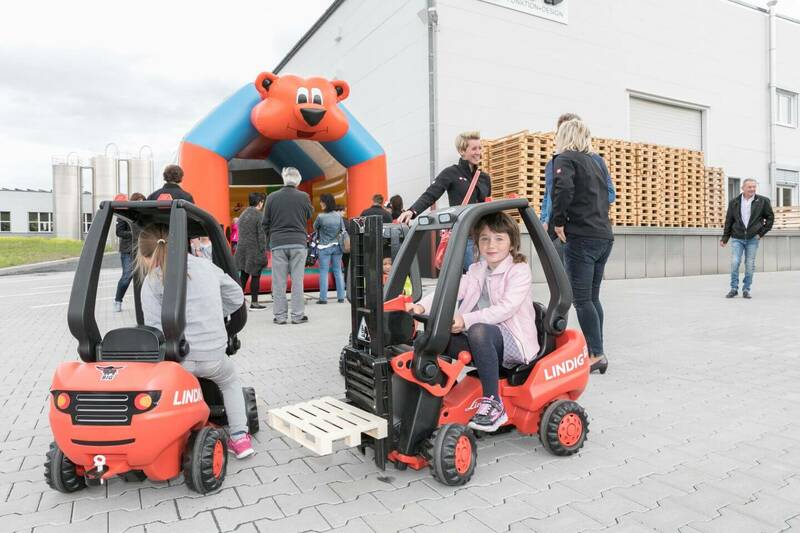 … the children could play on the bouncy castle or with the pedal-powered forklifts. Geisa, Wednesday, 28 June 2017. 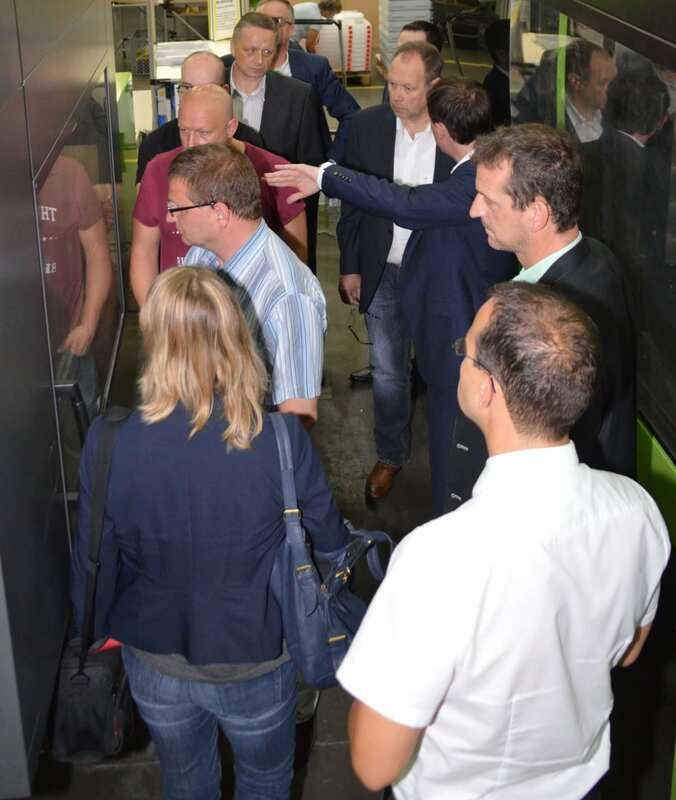 Four weeks prior to the beginning of the 1200th anniversary festivities of the town of Geisa between 28 July and 6 August, Mayor Martin Henkel and the festival committee visited the plastic case manufacturer W.AG Funktion + Design GmbH. 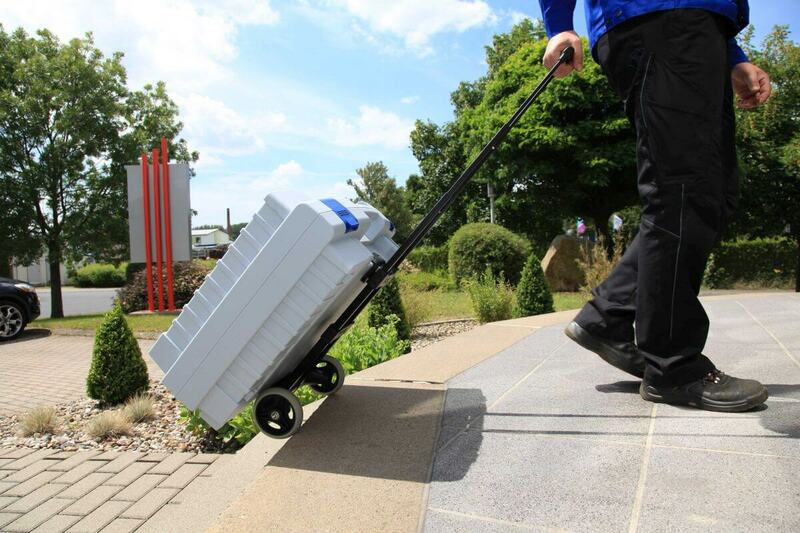 To promote the newly released chronicle of the town, the internationally renowned suitcase manufacturer donated a limited series of 500 anniversary cases worth 9,000 Euro. 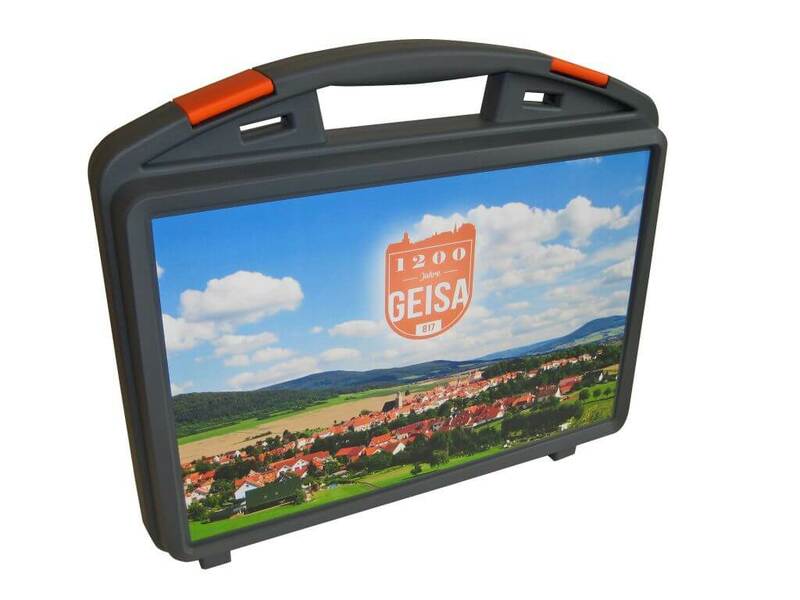 Picture 2: The IML panorama of the town by Thomas Höhl and the logo of the anniversary decorate the front of the case. 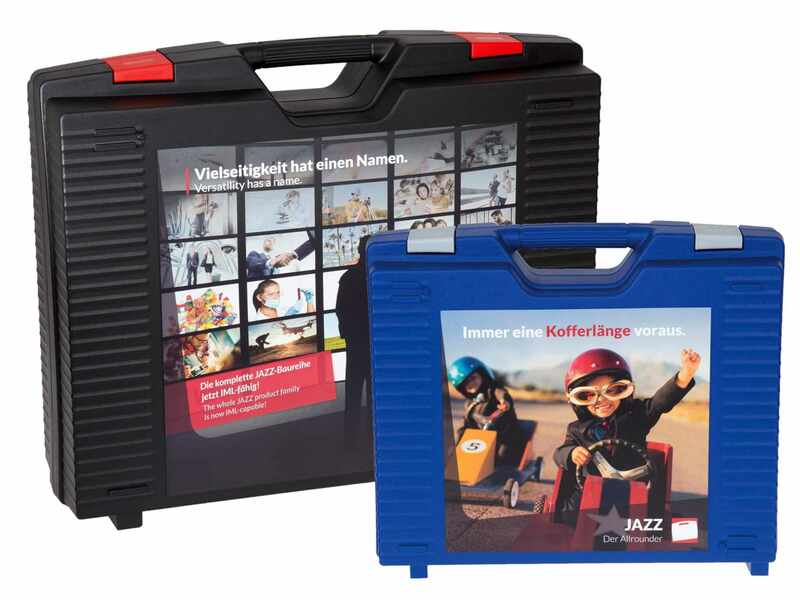 Picture 3: The new CI of W.AG Funktion + Design GmbH features on the back – the anniversary case is the first one on which the new logo is shown. 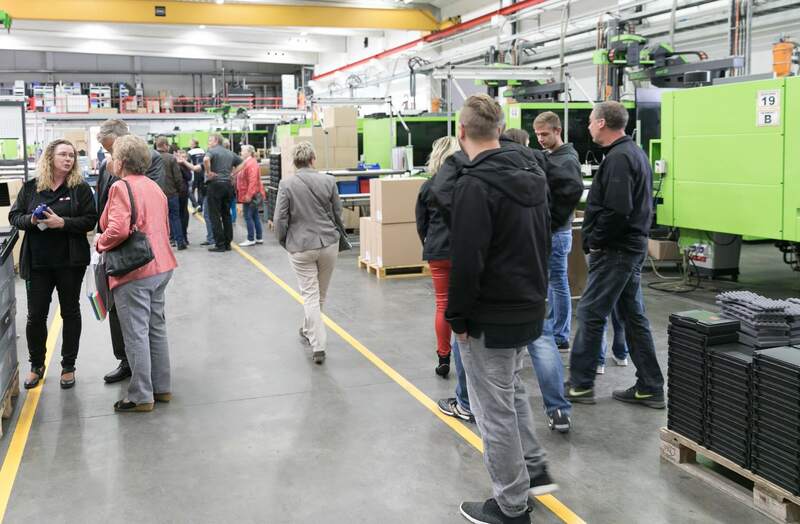 Picture 4: Future outside – history inside: the custom-made milled inlay by W.AG offers sufficient space and optimal support for the newly published chronicle. 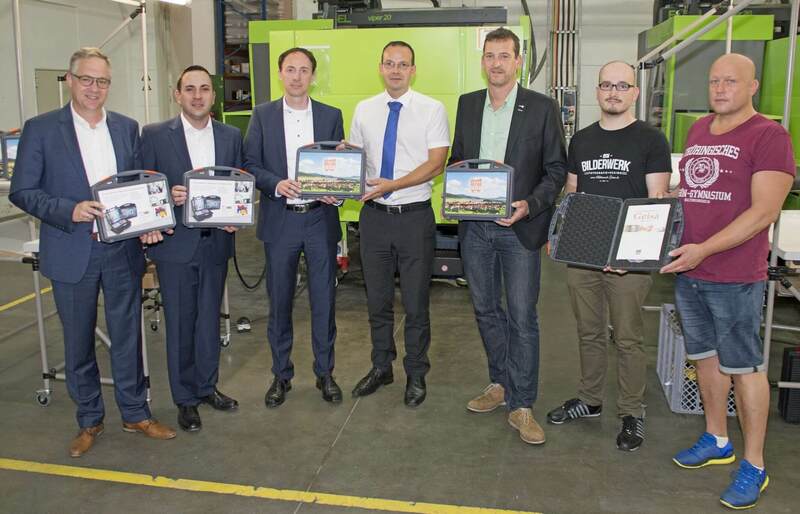 Picture 6: Mayor Martin Henkel (centre) was delighted with the anniversary case and praised CEO Konrad Goldbach (left) and Marketing Manager Markus Glotzbach (right). 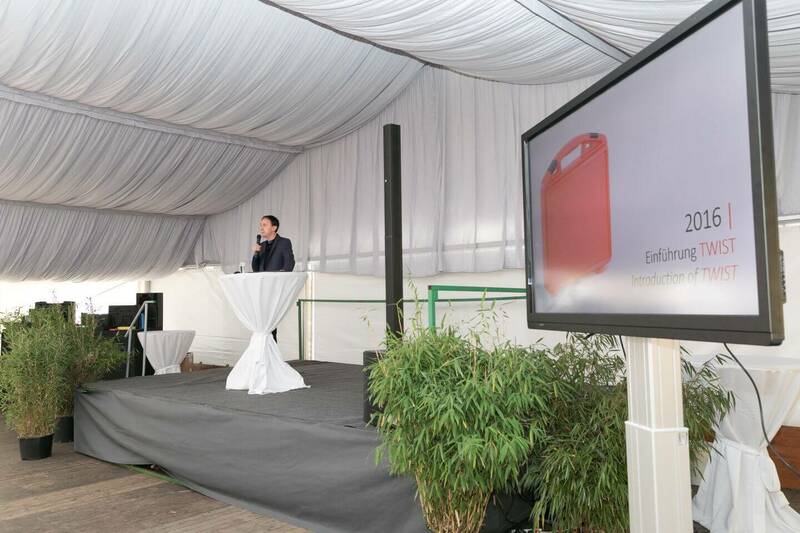 Picture 5: Mario Nothe, chairman of the festival committee and Markus Glotzbach developed the anniversary case together. 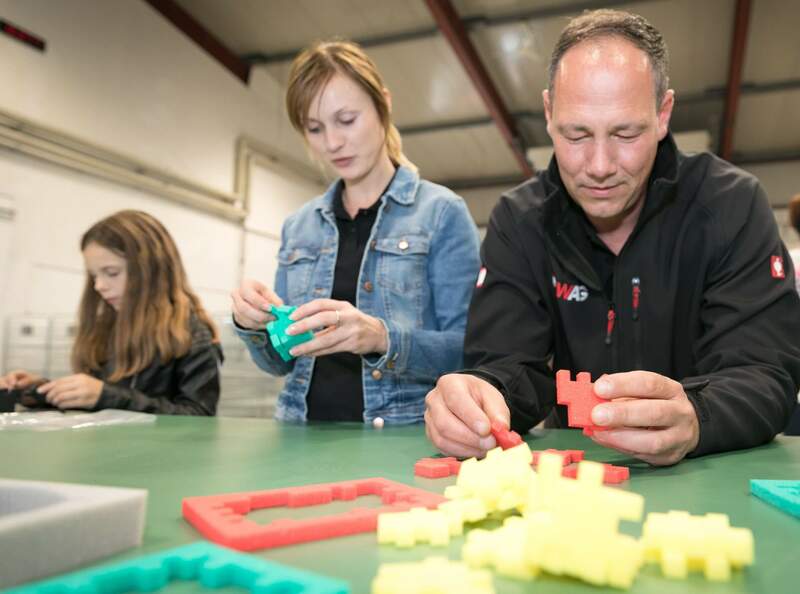 In April 2017, the prototyping department spent several days on a training course on foam inlays. 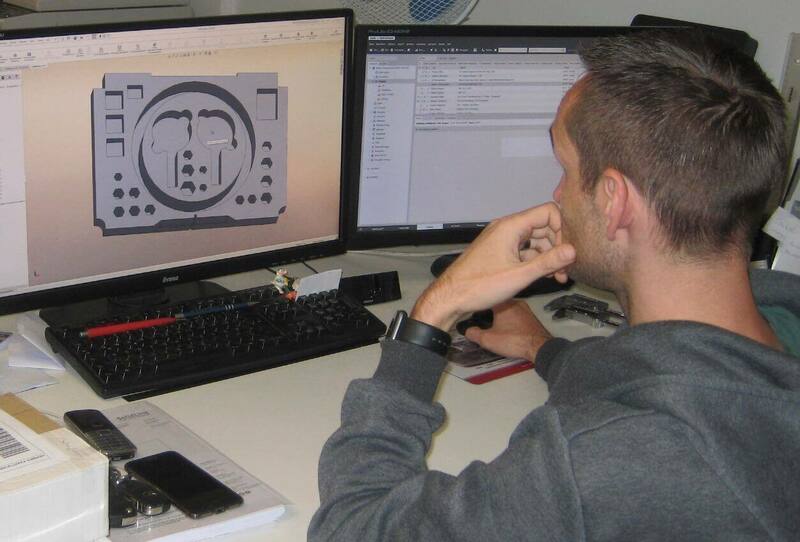 The emphasis of this training for the W.AG inlay designers was the creation of complex milled inlays. 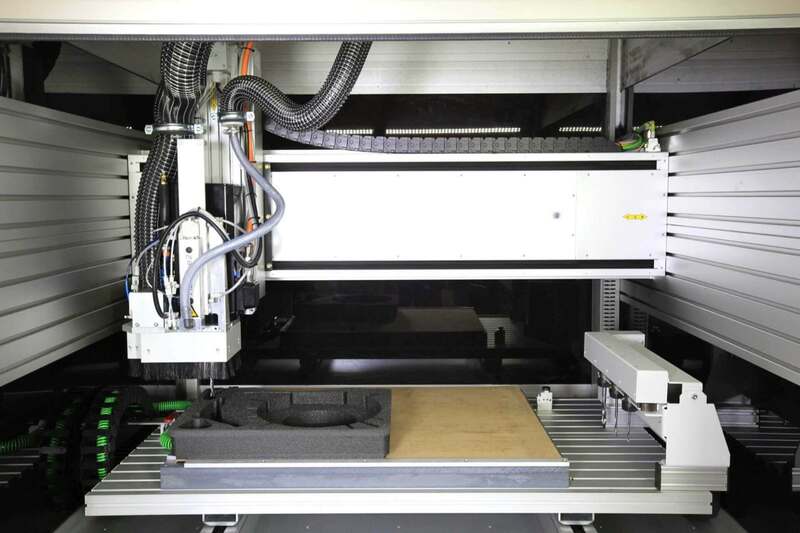 Because in practice, the use of hard foam for milled foam inlays often makes for easier implementation of complex inlay designs requested by the customer and offers optimal results. 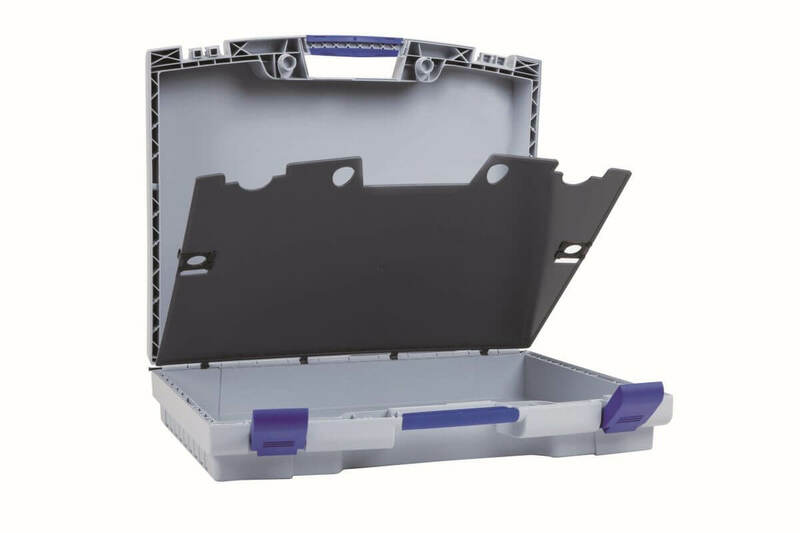 In spite of compartments with different depths and geometrical arrangement, milled foam inlays offer high solidity and steadiness. 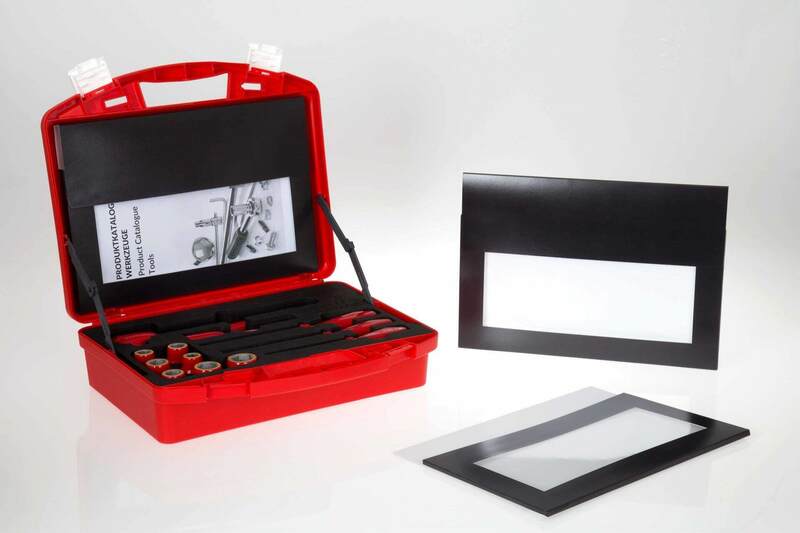 Especially for heavy inlay content, often there are structural advantages which ensure long life and professional use of inlays in daily use. 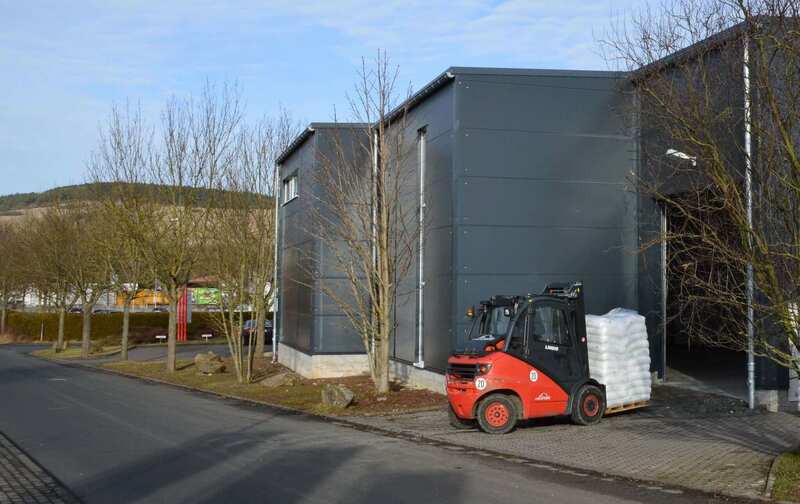 To further strengthen the production facility in Geisa, the case manufacturer W.AG invested in the construction of two new warehouses for increased production space and storage capacity for granule, foam and injection moulding tools. 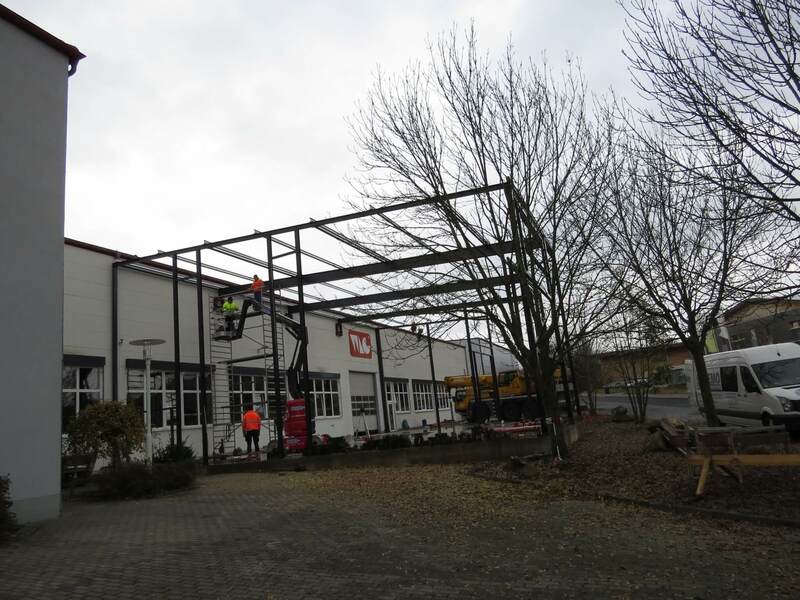 Just a few weeks after start of construction in November 2016: The new tool warehouse is beginning to take shape. 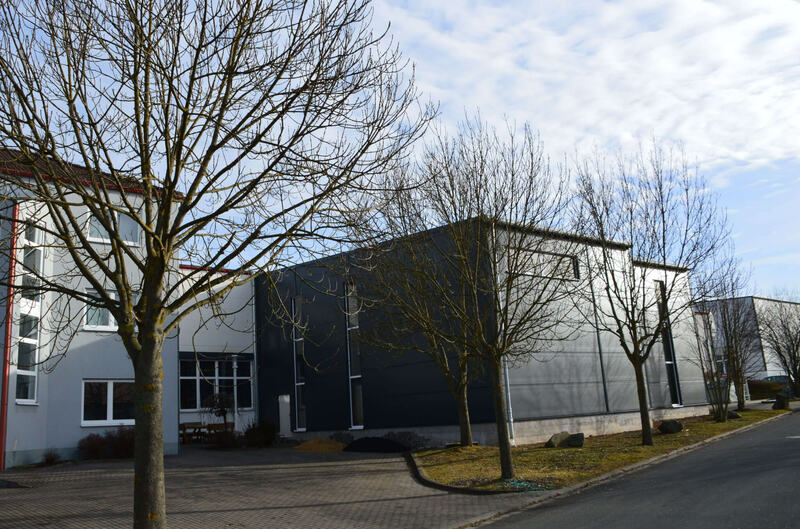 The warehouse in early March 2017: Operational for the storage of the injection moulding tools of all W.AG case series. 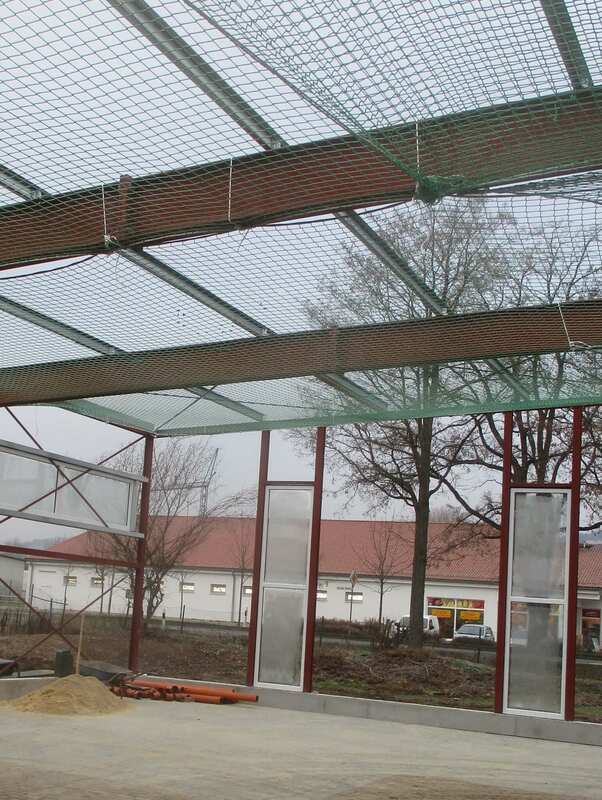 The new foam warehouse in the construction phase (December 2016). 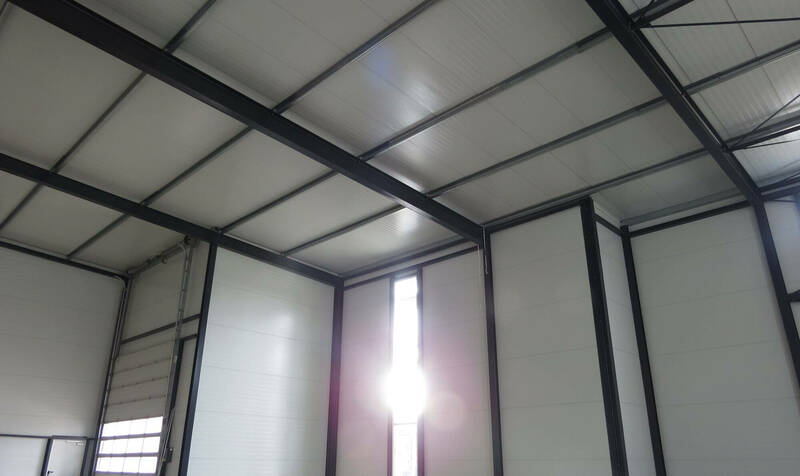 The finished warehouse in March 2017. 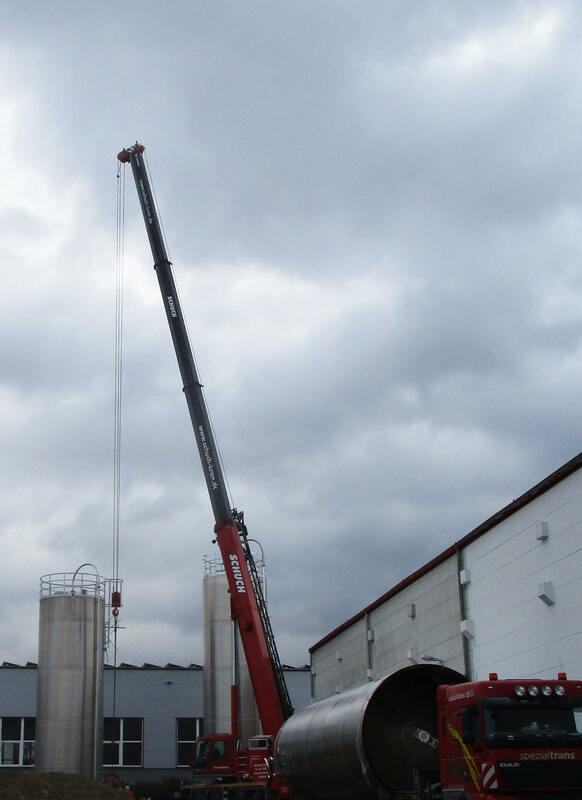 Delivery of the new silos. 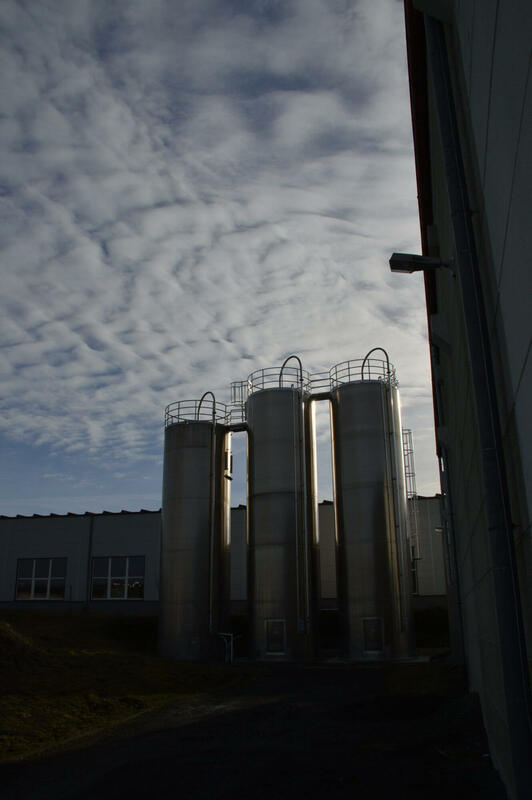 Additional pellet silos for injection moulding production. 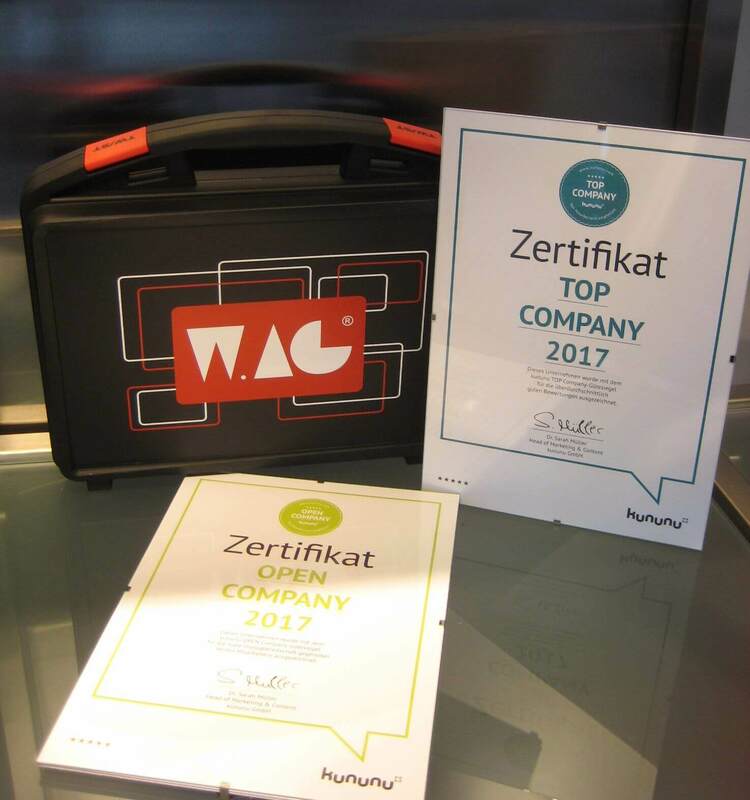 W.AG Funktion + Design GmbH bears the kununu quality seals TOP COMPANY and OPEN COMPANY since March 2017. 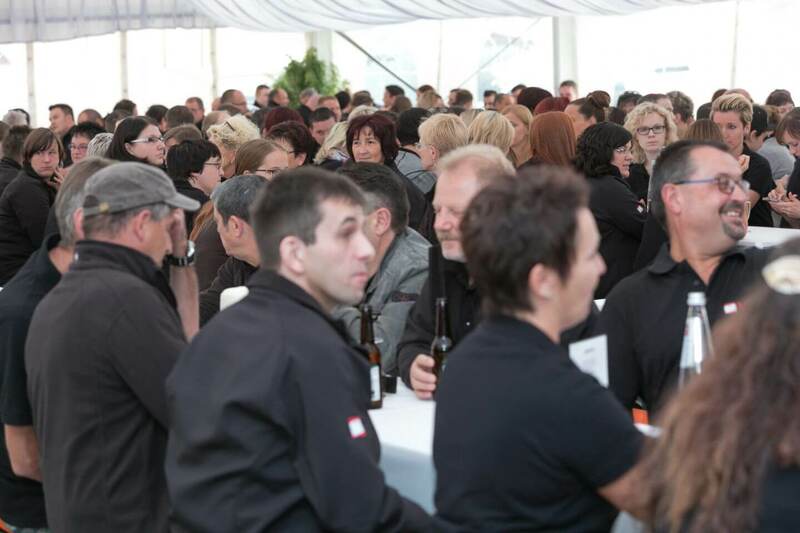 The leading employer evaluation platform kununu.com distinguishes employers who demonstrate high employee satisfaction and readiness in dialogue with a quality seal. 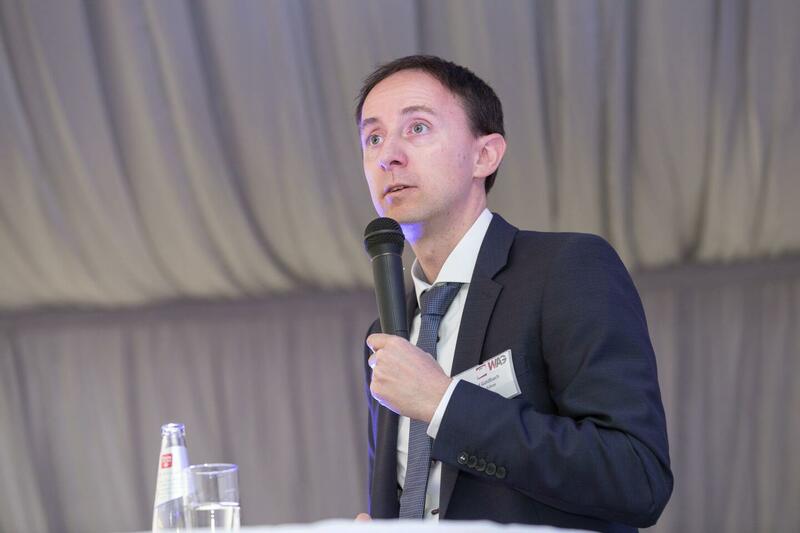 The status of TOP COMPANY can only be attained by good staff reviews with a total rating of at least three points; just as at least six reviews by employees are required. 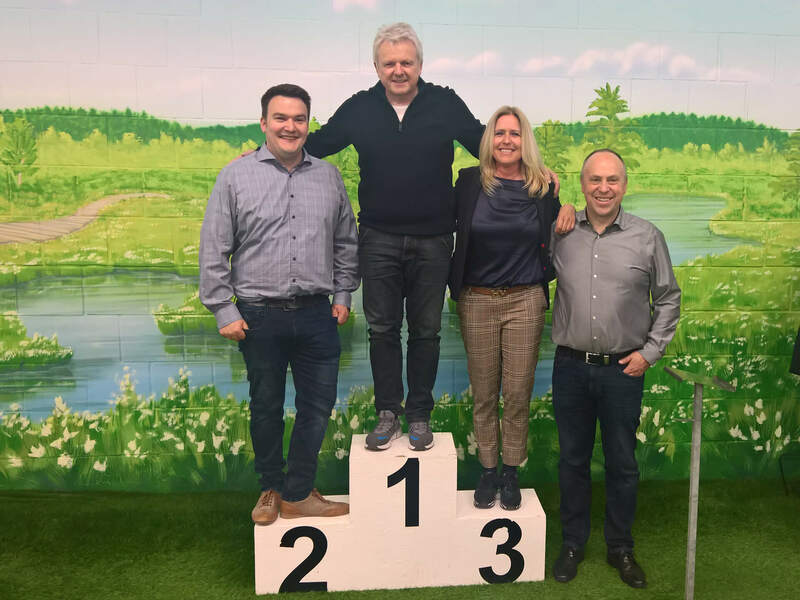 kununu awards the quality seal OPEN COMPANY to companies who actively call on its employees to do a review through kununu and comment on existing reviews.